Light the World with Fun, Magical Christ Centered Christmas Traditions! 7 Tips to Being a Calm Mom and Rockstar Wife! 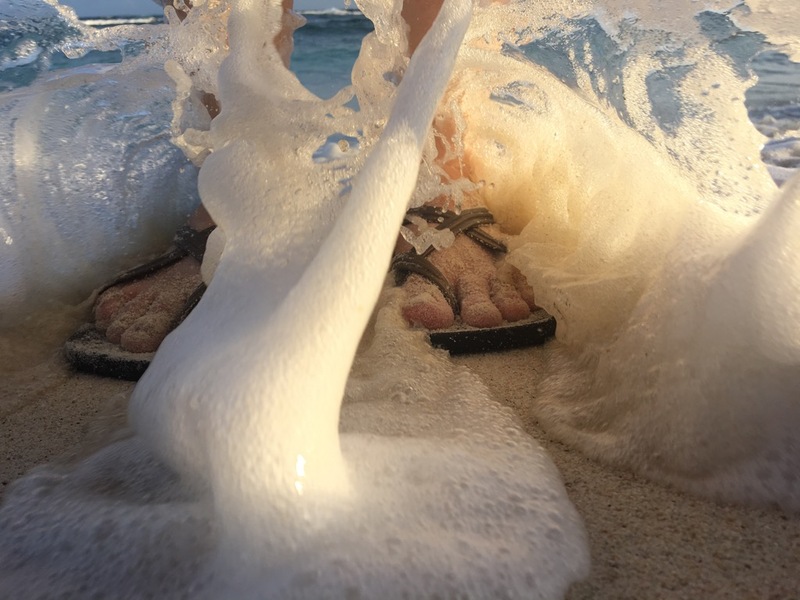 The wave crashed up washing black sand and frothy sea foam onto my bare feet and with it came a little white shell. I bent down and picked it up. Inspecting it carefully, I turned it around and around and then tried to return it into the ocean where it belonged. Rather than throwing it back I found myself whispering ‘just one more’ and guiltily stuffing it into my pockets. I laughed aloud at myself. Every. Single. Time. I saw a shell or a sparkly bit of sea-glass I felt compelled to pick it up. IT’s like I was remembering my childhood and hadn’t yet grown out of the habit of trying to keep pretty things. 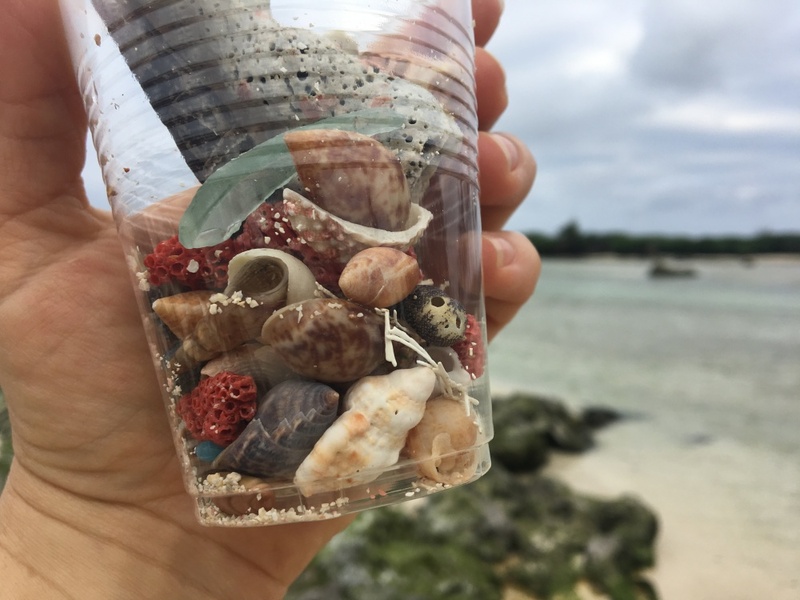 In fact my own collection of seashells which sat neglected on the countertop at home, was bigger than both my other sea collecting daughters pile. This obsession was becoming a problem and I’d have to stop soon! My kids who were ahead me on our walk came running back with their hands full of large dirty and broken seashells that they had found at a burnt out fire-pit. They were the huge snail shells that the locals would catch when the tide was out and roast over the fire for dinner. I remembered clearly not too many nights ago when Eric and I had heard noises outside and gone with our flashlights and machetes to investigate. We found a group of grown men squatted around a fire, laughing and joking. Eric and I were so entranced by their meal and methods had ended up staying and swapping stories until late into the night. When their rice was finally cooked in the heavy pot they had positioned overtop the fire, more men startled us both by seemingly appearing out of nowhere and throwing down their evenings haul. They had been out night diving and they had collected one small fish and 5 large snails. This would make the perfect meal they told us with a grin. We sat for hours visiting and watching as they taught us all the best ways to prepare snails and fish and rice. And then sometime after 10pm when their meal was finally cooked they divided it all up equally amongst themselves and dug in with their hands. Juicy snail water dripping off their fingers and contented smiles on their messy faces they offered us some of the food, but we declined. 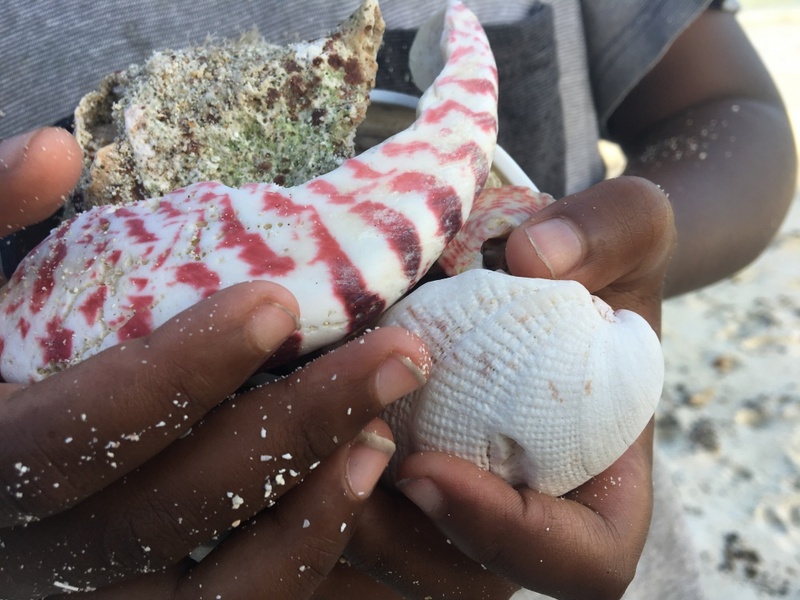 My mind jolted back to the present and I looked at the shells in the kids hands. They were ugly, brown, and burnt from the fire. But as I turned one around I saw a hint of mother of pearl. 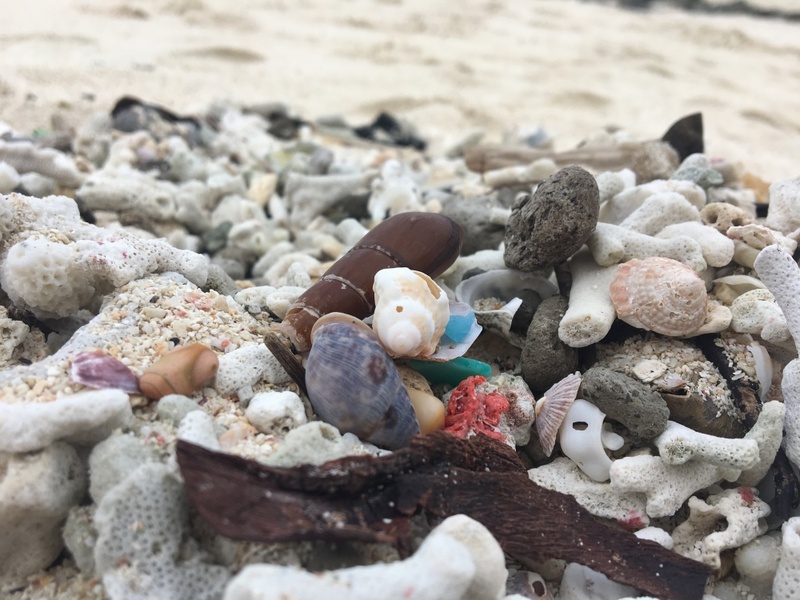 I Remembered back to my old childhood days on the islands when I would bring shells to my father and as if by some kind of voodoo he would transform them into something so breathtaking I was sure it had been made by magic or mermaids. There was mother of pearl in these shells, I was sure of it. I excitedly told the kids that we were going to do a science experiment. I had seen a bottle of Muriatic acid in the old shipping container out back and was sure it would do the trick. They had no idea what I was planning but I bossed them around telling them to get bowls and gloves and glasses and shells and water. We set everything out on the table and filled up the first bowl with the strong acid. Careful not to splash we gently set the dirty shells into the clear liquid. Immediately it started to bubble attacking the impurities and eating away the calcium coating. Only minutes passed before their hidden treasure started to show itself. Layers of Calcium Carbonate which had taken years to create, quickly dissolved and in it’s place was an iridescent shimmery shell that looked incredibly more beautiful and valuable than anything the children had ever seen. They were mesmerised by the transformation and began asking so many questions. Where had it come from? Why was it covered up? How did I know it was there? I was having a proud mamma moment at having successfully impressed my kids as well as nephews when I realized that God had his own message He was trying to tell me. I excitedly told the kids that we were going to do a science experiment. I had seen a bottle of Muriatic acid in the old shipping container out back and hoped it would do the trick. They had no idea what I was planning but I bossed them around telling them to get bowls and gloves and glasses and shells and water. We set everything out on the table and filled up the first bowl with the strong acid. Careful not to splash we gently set the dirty shells into the clear liquid. Immediately it started to bubble attacking the impurities and eating away the calcium coating. Only minutes passed before their hidden treasure started to show itself. Layers of Calcium Carbonate which had taken years to create, quickly dissolved and in it’s place was an iridescent shimmery shell that looked incredibly more beautiful and valuable than anything the children had ever seen. They were mesmerised by the transformation and began asking so many questions. Where had it come from? Why was it covered up? How did I know it was there? 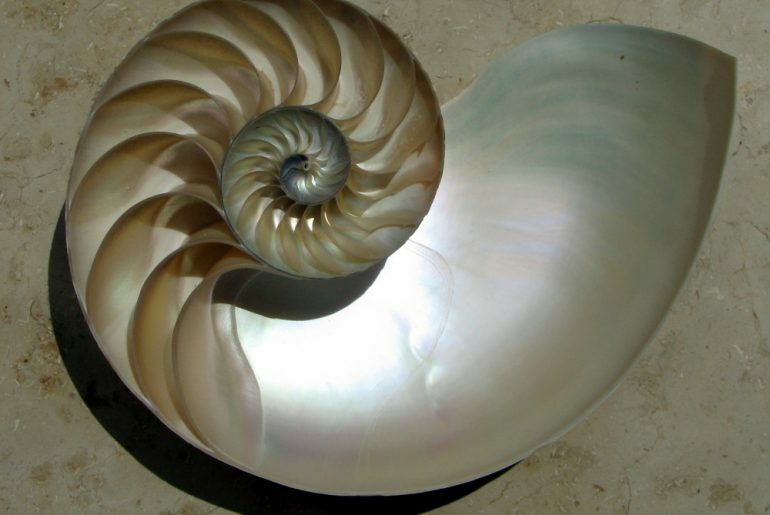 The mother of pearl had always been inside that shell. It took a process that I am sure would have been painful to that shell if it had feelings to feel. But it was worth it! It’s light was shining. 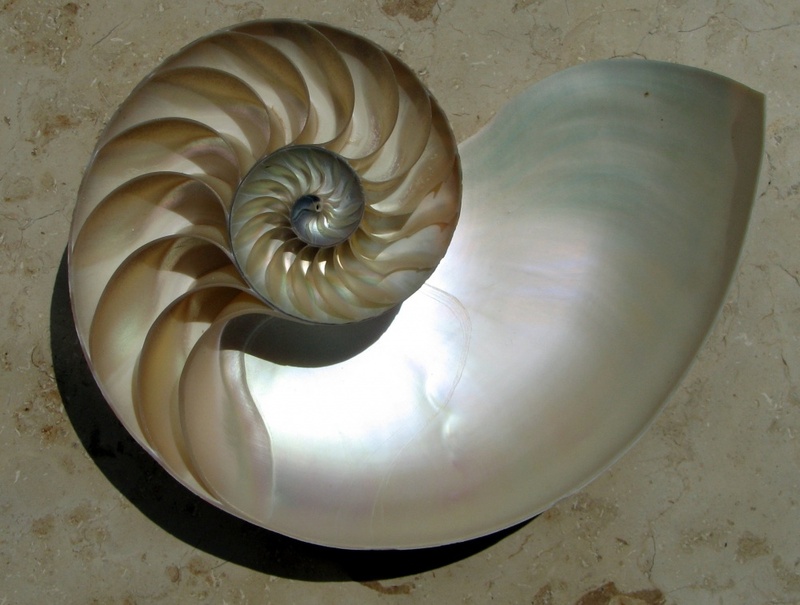 I want to be like that shell, broken and covered in sin and sorrow but humble enough to turn my life over to He who can heal. He who can make whole. He who can erase my sins and make me new again, even Jesus Christ. May I share a story with you? About a year ago we got tired of living in Alberta. 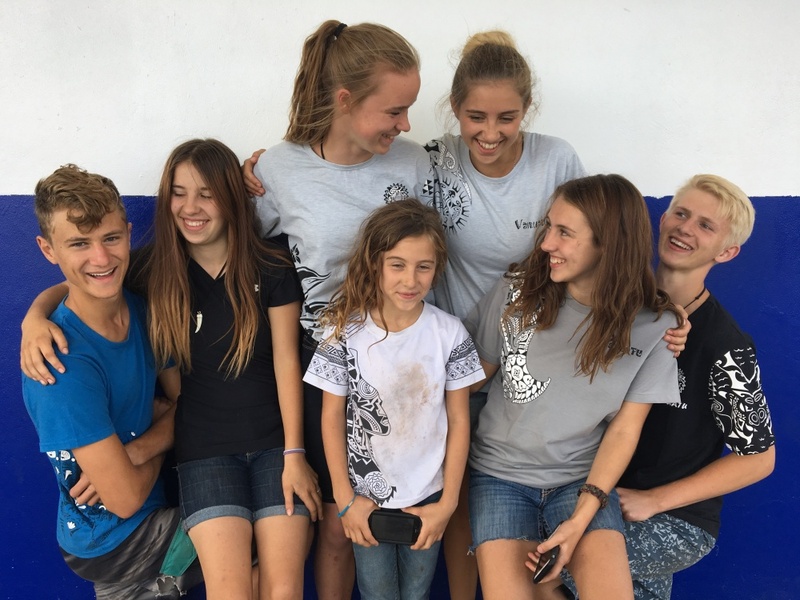 We decided to take our kids for a short adventure to a small 3rd world country, located on a little island off the coast of Australia. I was excited to escape all the snaps and texts and tweets of our modern society, and spend a little time with our family. Turns out that it was the best decision we ever made and you can read all about it here: www.heybeckyboo.com. 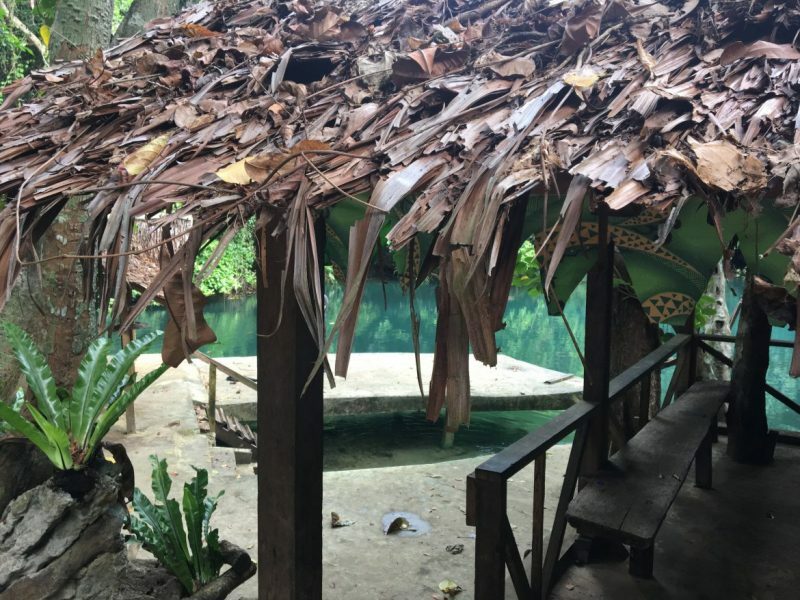 Our four month trip quickly turned into a one year trip as we experienced paradise in a raw and real way with our family. As we wandered about enjoying the adventures I received a text one day from the owner of Showhome Furniture saying; “Hey, we want to donate some money- please use it to help people” I was ecstatic! There was an abundance of truly extraordinary people that I could help with this donation. I want to tell you about just one. 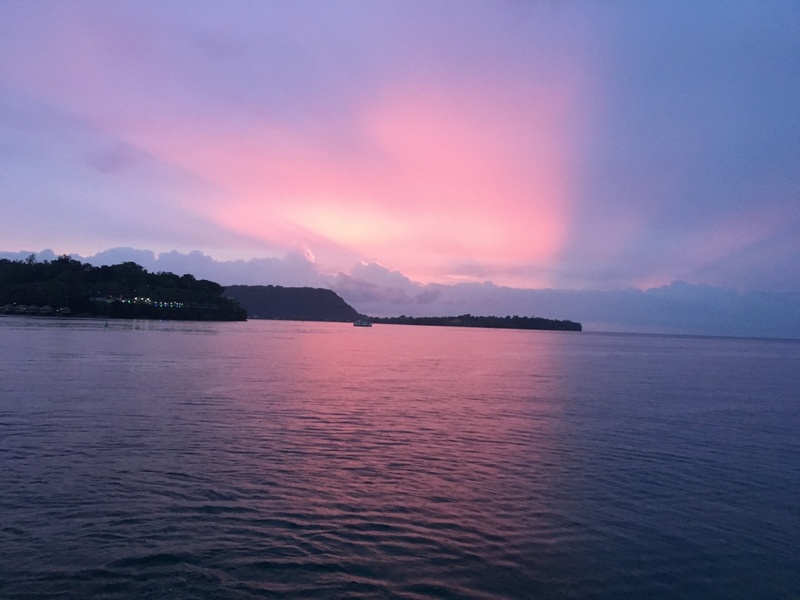 I sat down on our couch looking out over the swimming pool and towards the glistening ocean- the sunset was shades of pink and purple that would take your breath away. But it wasn’t the sunset I was thinking about. There was a young man whose face I couldn’t get out of my head. One of my daughters had befriended him earlier in the year and I felt strongly like I should invite him over for dinner that night. I logged onto FB and sent him a quick message. 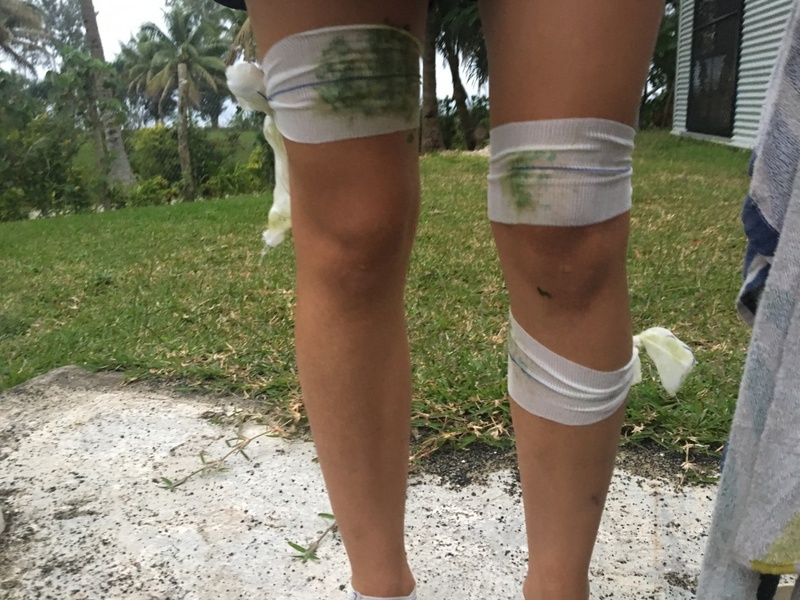 I was surprised a couple minutes later, when he replied that he was on the other side of the island, in a tiny village, staying with grandparents, and wouldn’t be able to make it. I asked him to tell my about his grandma and grandpa. He explained that they were old and dying. They lived in a tiny tin shack. The grandpa couldn’t walk and was mostly blind and the grandma took care of them both, but they had recently come on hard times. 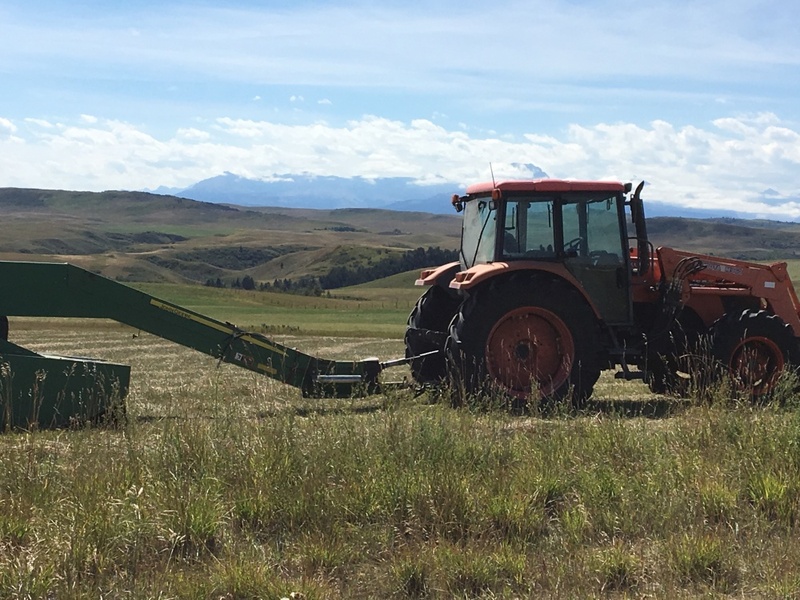 I gathered my kids together and told them about the money that we had recently received as an unsolicited donation from Showhome Furniture Calgary, and then told them about the old couple I had just learned about. My kids immediately asked if we could use some of the money to bring them food. Of course I agreed, and we said a little prayer together, asking God to help us know what to buy that would most greatly alleviate their burdens. A few minutes later, we jumped in the truck and drove to the biggest grocery store on the island. We started with buying them some rice and beans and breakfast crackers. Then we added some soap, and shampoo. Knowing how bad the pests can get we put in some rat traps and mosquito coils. Then we added some wash cloths and towels, toothbrushes, toothpaste, some bandaids and antibiotic ointment, some medicine for headaches and fevers. We thought they might be cold and put in blankets and some matches. We wondered if they needed garbage bags and a scrub brush. Laundry clips and a laundry line and the list went on. Every time one of the kids suggested something everyone else said ‘oh yes, they will need that for sure’. Before long we had two full carts, and we really felt like there wasn’t anything else that they would need. We paid for everything, packed it all nicely into some containers and started our journey down the bumpy island roads. We first stopped by and picked up the young man we had invited for dinner. His eyes were wide with wonder as he saw the bags and boxes of food piled into the back of the truck but he didn’t ask any questions or say anything. I hoped that he wouldn’t be hurt or offended and prayed that he would see that we were truly just trying to be kind. He guided us across the island until nearly an hour later, at the end of a little road, and far away we found their house. His aunty came out of the house first and our friend said something to her in their native tongue. She immediately smiled, looking shy. 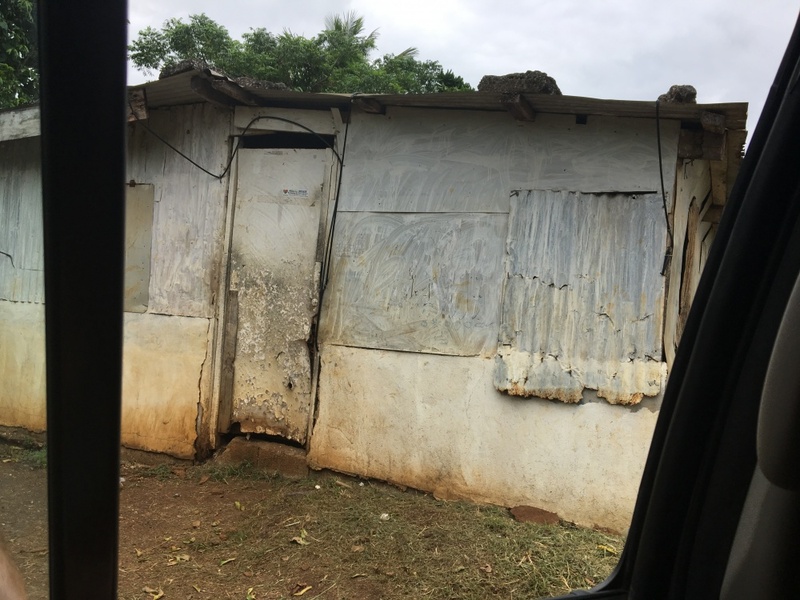 Then the young man jumped out of the back of the truck, and ducked inside the smallest and most humble patchwork of rusty tin, that was the home to his grandparents. He gently led his grandma out and with his arm in hers, said softly, but within earshot ‘grandma, my friends asked if they could bring you a small bag of rice and I had no idea that they were going to do this.” Her arms were so tiny and frail that I thought she might blow away with the next puff of wind, but it was her eyes that stuck with me most. She looked so surprised as she glanced down at the offering of food and supplies, and then burst out into the kind of smile you never forget. Her eyes bright with hope, and love, and gratitude, began to weep with tears. She hugged me and held me as tightly as her weakened body was able whispering ‘thank you, thank you’. We only stayed a few minutes but I knew then, that when she died it would not be from hunger. Several weeks passed and I was busy with all our adventuring, not thinking too much on the experience we had had with this lovely grandma. 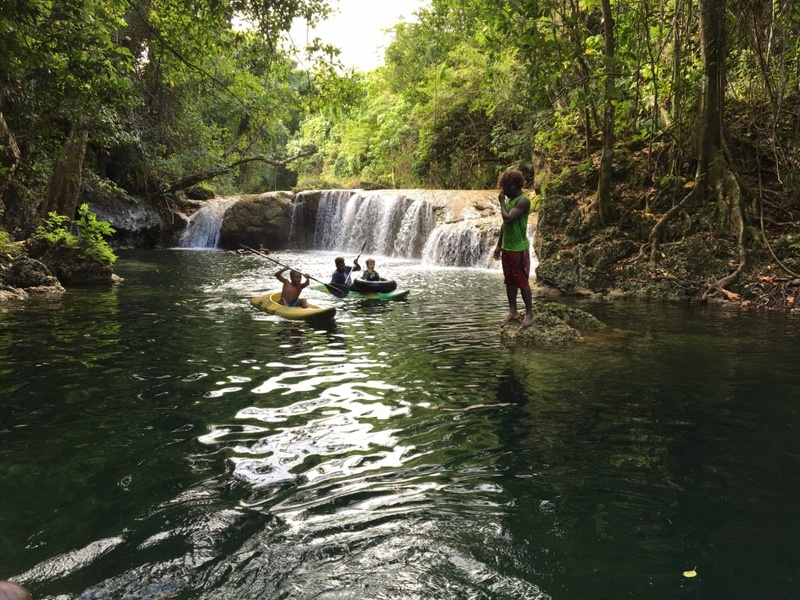 But on one particularly slow day, we called up our friend and asked him if he wanted to come swimming in a waterfall with us that was near the Village of Teoma where his grandparents lived. He was very excited and after driving forever in the back of the pickup truck with the rest of the kids, knocked on the glass of the window. We pulled over and asked him what he wanted. He said that he would like to bring his sister, and if we just stopped at his grandparents house we would find her there. We pulled back onto that bumpy road and bounced up and down until we found the same little house we had visited over a month earlier. We were there for maybe 10 seconds when out of the house, as fast as she could manage on her weathered legs came his grandma. She was undressed except a thin piece of fabric wrapped around her tiny body, but she was clutching something to her chest. Knocking on the window of the truck , she beckoned me to get out. I was in my swimsuit as I was prepared for the waterfall we would visit, but still I climbed out, hoping she wouldn’t mind my immodesty. 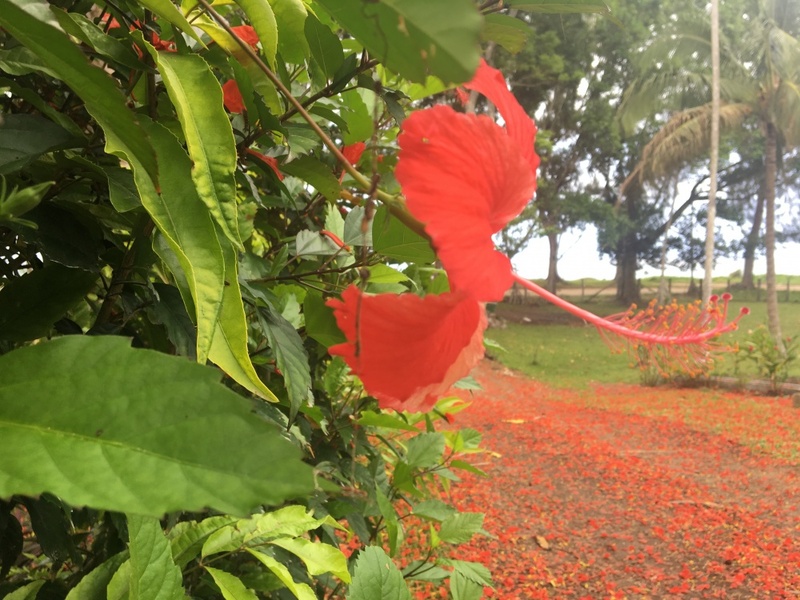 She wrapped her arms around me, and covered me in kisses, and then gave me a brightly coloured, red flowered, island dress. She told me that she sewed it herself and had just been waiting for me to come back so that she could give it to me. Her beautiful smile and sparkling eyes burst with joy as I pulled the dress over my swimsuit and took a picture with her. I know what a sacrifice it must have been for her to buy the precious piece of calico that would become this dress. I have no idea how many days and weeks she had been waiting, holding onto that dress, hoping for the day we might stop by, but I was so glad that that day we decided to go there. 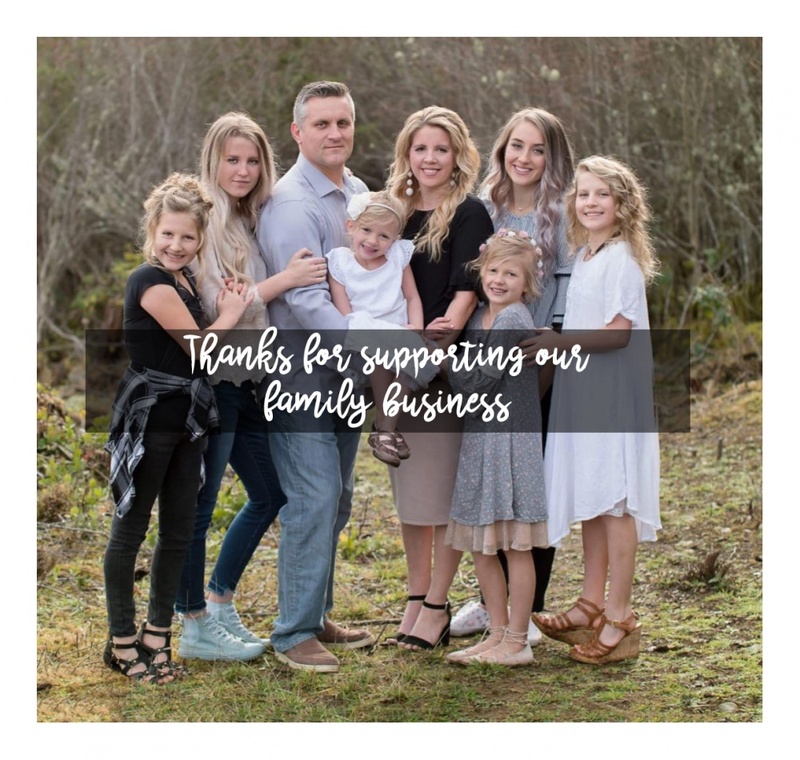 From the bottom of my heart I wanted to thank Showhome Furniture for the quiet and kind service that they gave this family and so many others through their donation. You will probably never know the real impact that a little money has had in such a poor country. Thank you and may God bless you for your generosity! 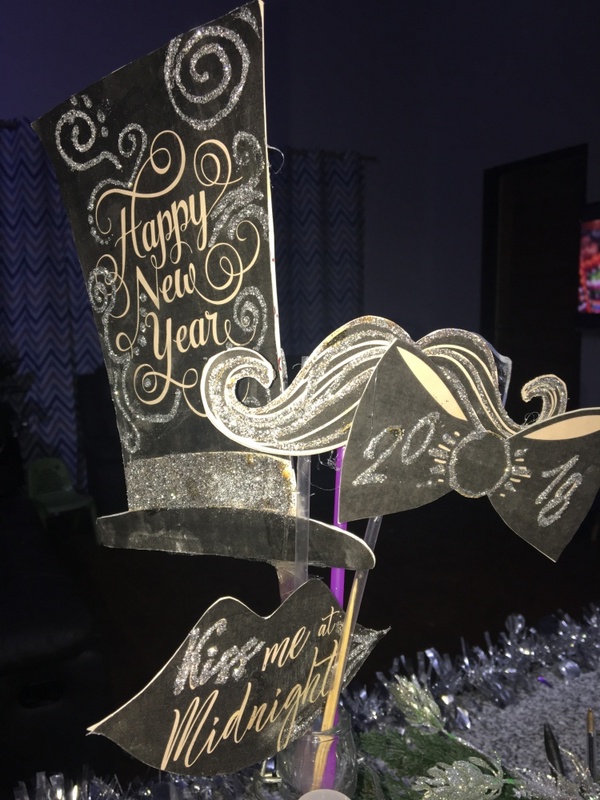 New Years Eve Wasn’t What I Had Expected! 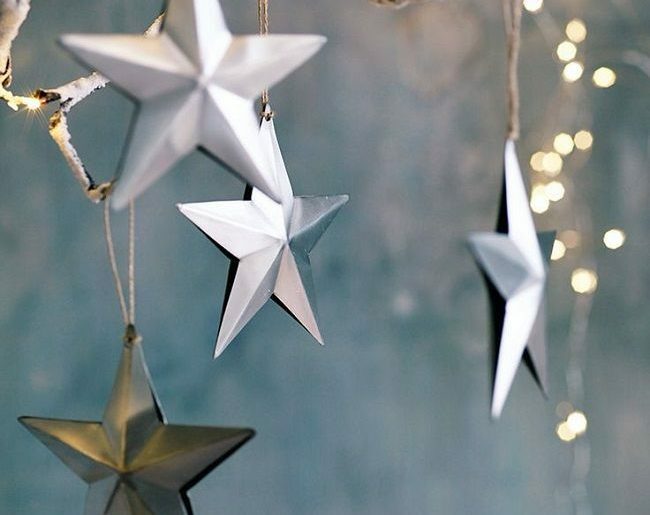 Sparkling stars shimmered in the light, and tinsel garland hung from everything. It would be weeks before we’d be able to clean up all the glitter that was like a magical blanket spread all over the house. 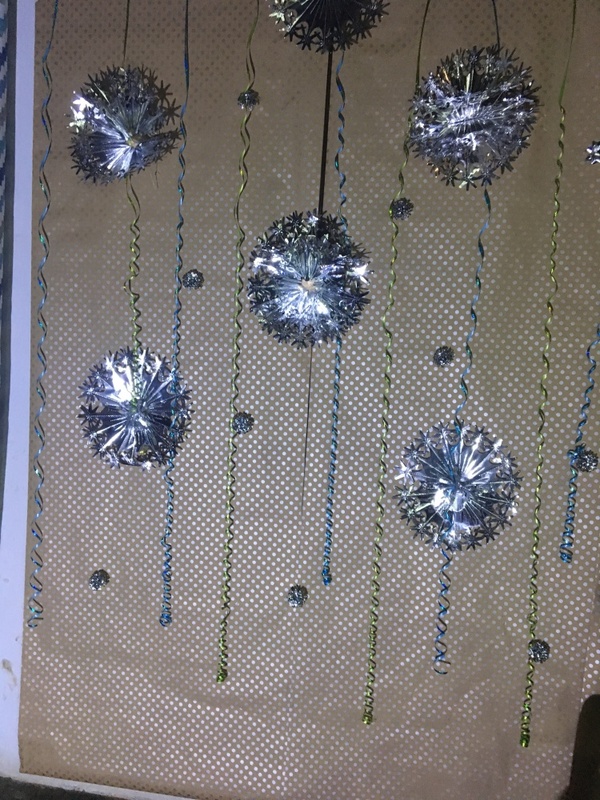 Glitter is the kind of magic that Eric hates. We had spent all week getting ready for our New Years party. 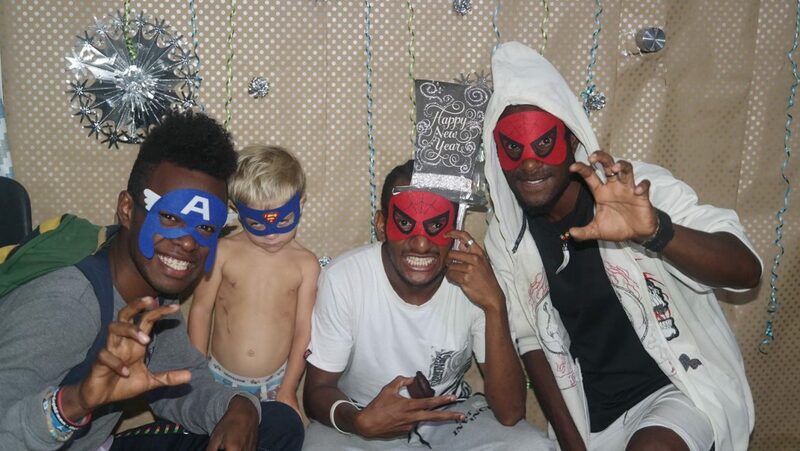 Something inside of me just wanted to spoil everyone that was coming with the most amazing party they had ever seen. We were so excited to celebrate with our friends, that all the time, all the money and all the hard work didn’t even bother us because we just kept telling each other how excited and grateful everyone would be. Whisking, and mixing, the girls and I had created a feast to be proud of! The Passionfruit cheesecake was glazed to perfection as it sat covered in the fridge. 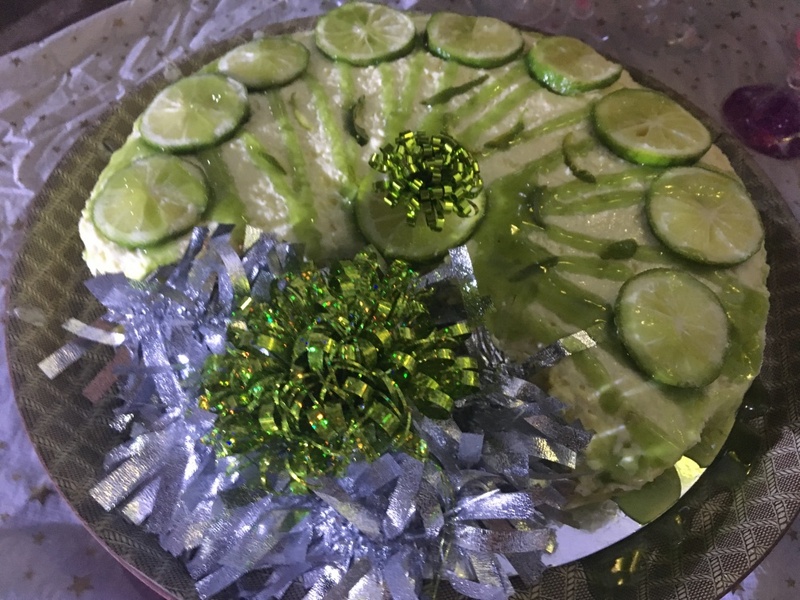 We had cut fresh limes which we used to decorate the lime cheesecake and then drizzled it with a light fresh lime glaze. 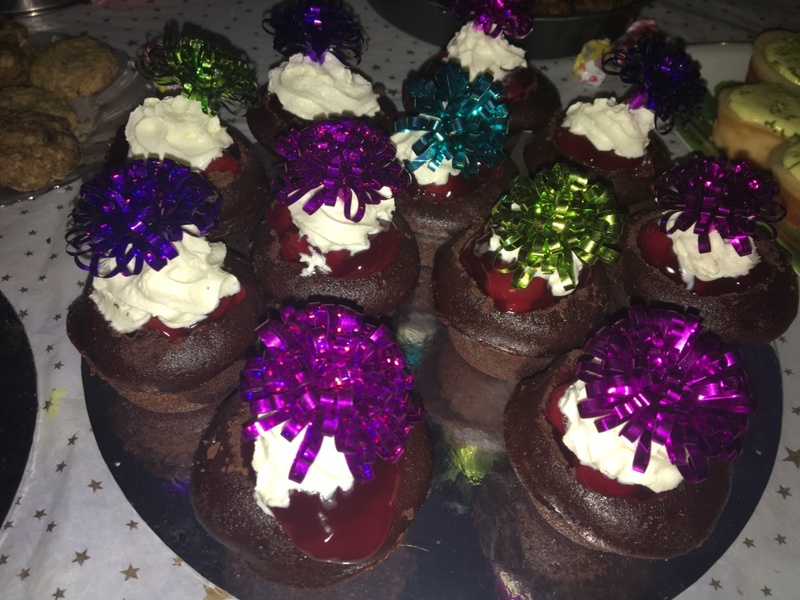 The cherries and whip cream were overflowing from their black forest cake holders which surrounded them and the lemon mouse bars were sinfully delicious. On top of all that was meatballs, spanakopitas, pinwheels, crackers, cheese olives and too many other things to even name. 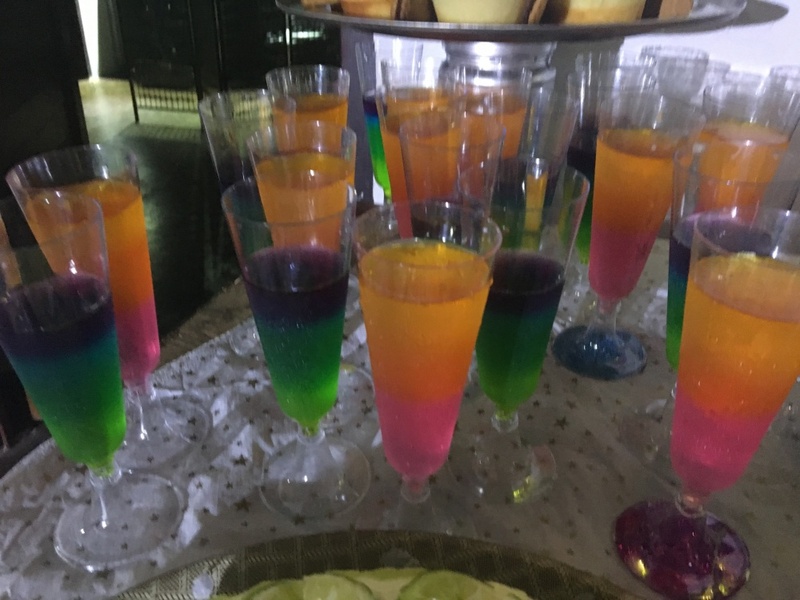 Probably my favourite treat was the ombre coloured jello made up of 4 kinds of tropical flavours and layered perfectly in the plastic champagne glasses I found hiding in the back corner of a Chinese shop earlier in the week. We had a wishing tree, gifts for everyone, and hundreds of balloons, a picture wall and so many fun games we probably wouldn’t even be able to play them all. I was so excited. I had high expectations for the evening. When the time for the party finally arrived Teenagers, Young adults and adults all filled our home to bursting. 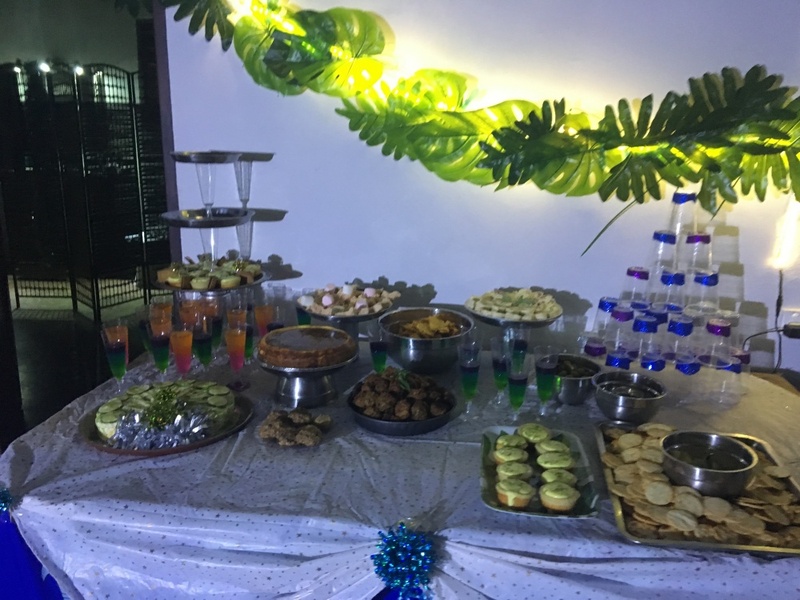 I had invited 30 people and more than 40 showed up. The tables were piled so high with food I was certain that we would never be able to eat it all. The party began and even though we all barely fit inside the house it was the perfect group for some of the big games I had planned. After about an hour of games, Eric and I did a short devotional together and gave everyone their gifs. 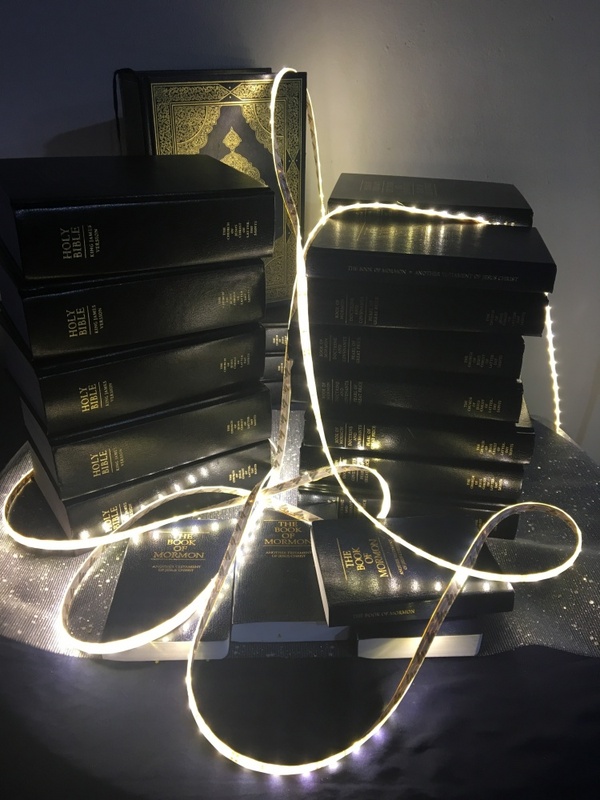 The gifts were books of scriptures that I invited them to write in to use as a sort of journal for the upcoming year. We had searched all over town for the books and had finally found someone willing to sell us all that they had just for the activity. I invited everyone to eat and then was just getting ready to initiate the 2nd round of games when suddenly, and completely unexpectedly 22 of my 30 guests stood up and told me that they had to leave. I thought maybe it was a joke but I was wrong. Everyone had other parties that they wanted to attend. I looked at my basket of unopened prizes and my long list of games that I was so excited to play. I couldn’t help but notice the house which was a total disaster and the piles and piles of empty plates and tables of food. I was shocked that the food had been eaten so quickly. 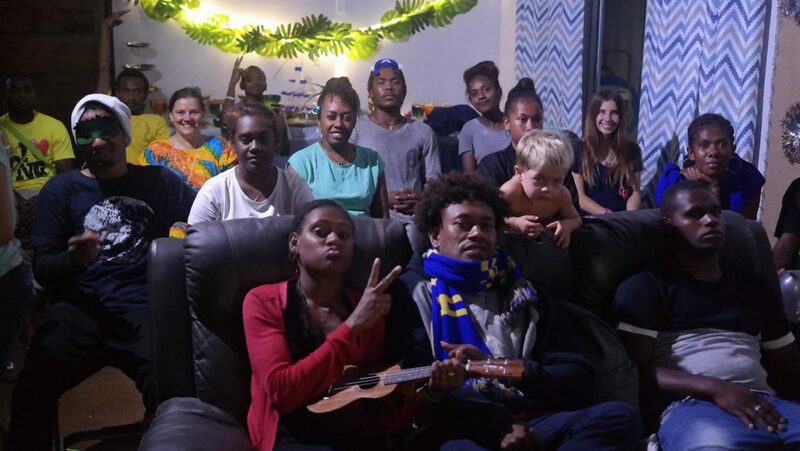 The 22 people who were going were the best friends I had in Vanuatu. Each one was very special to me, and this party was my gift to them, were they really all just going to leave me like this? I wanted to run into my room and cry. Cry in anger and frustration and disappointment. I wanted to shake everyone and tell them that it wasn’t okay to just leave like this. I wanted to tell the 8 guests that were staying to leave and go home because I was just going to go to bed and hide under my covers. The truth was, I barely knew most of the 8 guests that were staying. They were all people who had been invited at the last minute or by someone else and I really wasn’t close with any of them. I’m sure they would have understood if I told them that the party was ending. I felt a voice whisper softly to my heart but I didn’t want to listen to it. I didn’t want to listen because I was so sad. But the voice came again and softly reminded me: “Rebecca, look around you- you have your family and 8 beautiful, good people who could use your love and your friendship. Don’t give up because of choices other people are making, make your own choices and enjoy your night just as you planned.” I knew it was the voice of God trying to reason with me. I was bitter, and I didn’t want to be reasoned with, but He was right (as always). And so I decided to keep going. I played every game and sang every song, and gave out every prize and enjoyed every minute of our celebrations. In fact we ended up having so much fun that we didn’t even realise it when midnight came and went. and before you knew it it was 3:00am and I was sending everyone to bed. Eric was exhausted, but he kissed me as he said that it was the best party we’ve ever had and thank you so much for throwing it. That’s my lesson for tonight. Just be willing to let it go. Let go of all the things you can’t control, all the things that didn’t turn out the way you anticipated and just enjoy life as it is. 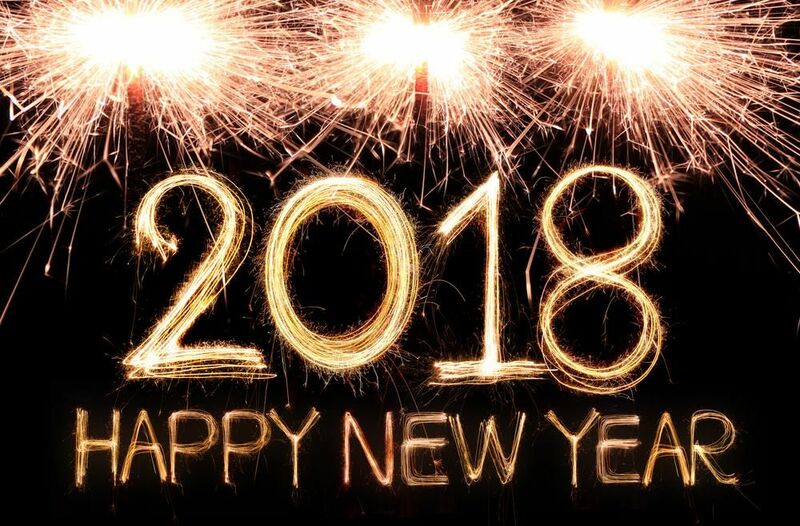 I am going to slay 2018! Hundreds of trees of every shade of green surrounded our little home on the beach. The giant nabunga tree was visited daily by children climbing it or hunting the cobra constrictor snakes that lay hiding inside. The palms were overloaded with coconuts that we used for our meals. 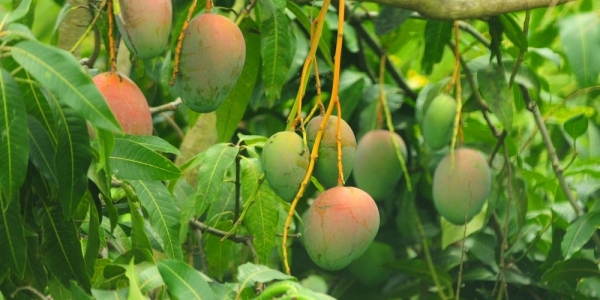 Mangos dropped by the dozens each day from the mango tree and were gathered up by kids, neighbours and friends who filled their bags to overflowing with the tasty treats. 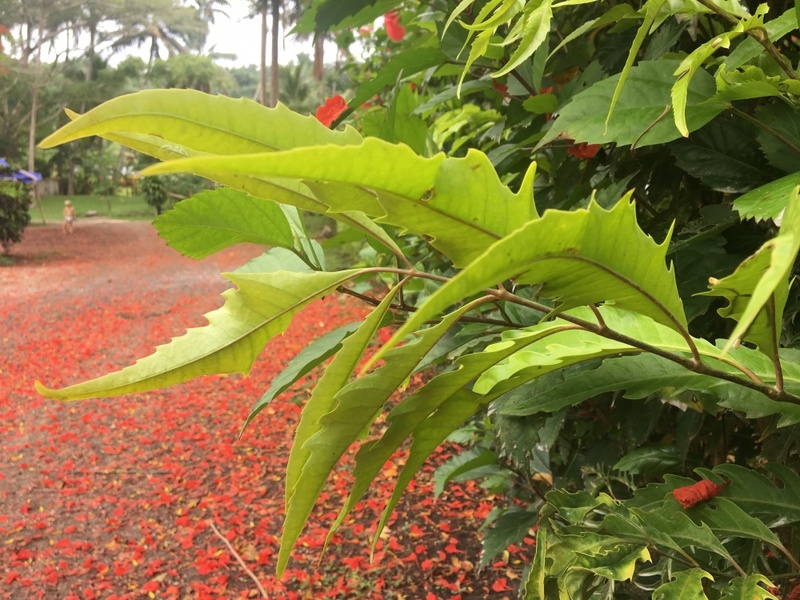 The avocado tree provided more avocados than you could imagine eating and the papaya trees, banana trees and lemon trees all contributed their small part to the family dinner table as well. The trees were so beautiful, each one different and each one doing their part for the community. I sat outside on the deck swing looking over towards the edge of the yard. This wasn’t the first time I had noticed the towering tree whose canopy of dead branch spread out into the sky and overtop of the road and swimming pool. In fact several times throughout the year I had wondered about it. 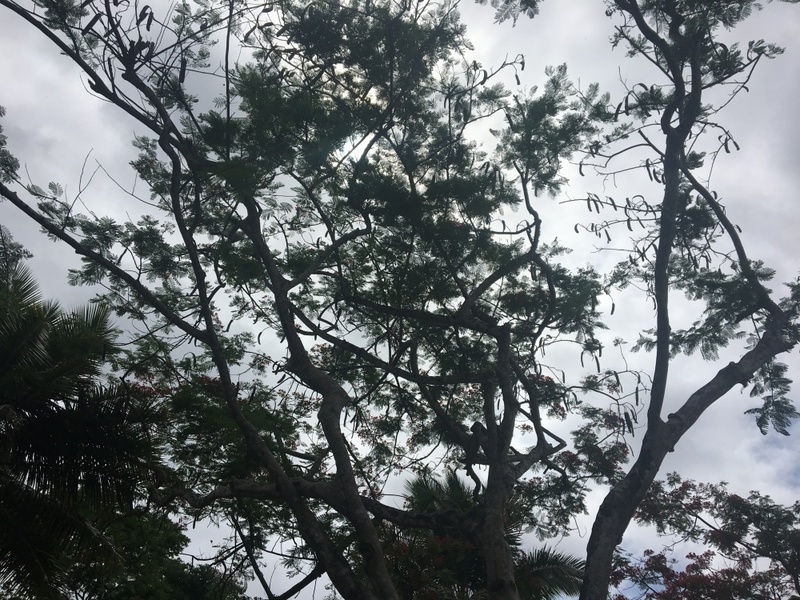 Several months ago we had hired a master tree cutter to remove all the dead and dying trees to protect us from dangerous flying branches during the upcoming cyclone season. I had laughed thinking about just what a fool the so called expert was that he could be hired to do a job and miss something so obvious as that large tree I was now staring at. In November I discovered that it was I who was the fool. 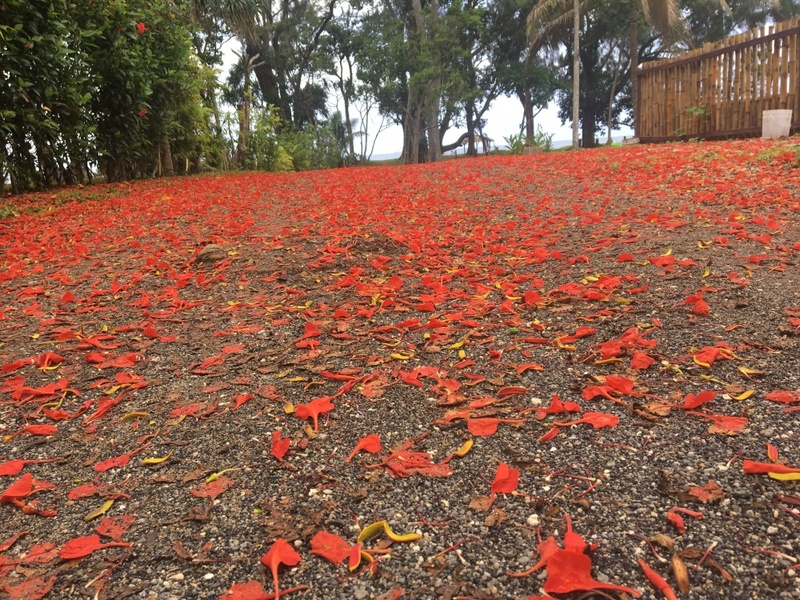 I woke up to the birds singing loudly outside one morning and when I peeked through the bedroom window I beheld to my amazement that the whole world was covered in a sea of bright red blossoms. That big tree that I had resented for taking up so much space in our yard wasn’t dead at all! In fact it was more alive and vibrant than any tree around. I couldn’t believe that all this time, I had been wrong. 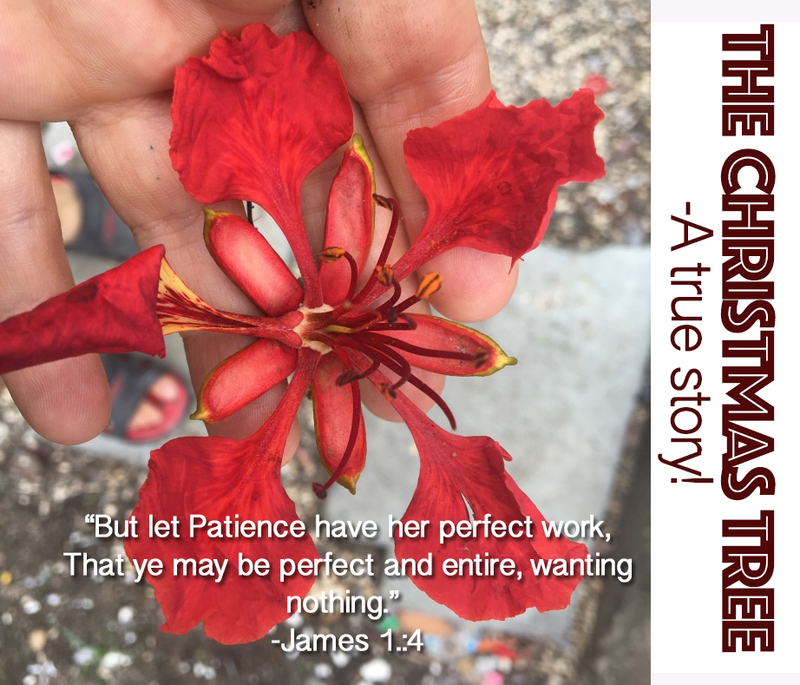 When I asked the local villagers the name of this glorious tree that had just come alive in my garden, they said it was called the “Christmas Tree”. All year it just simply waited. Waited for it’s time to bloom. 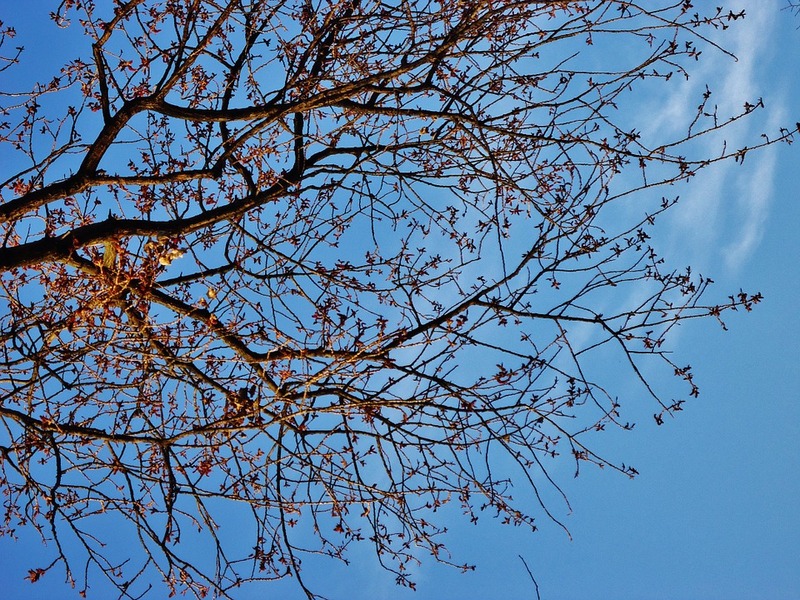 And while I secretly criticised it for it’s empty bare branches, it knew all along that it was something much more. Then, just when we were getting ready to celebrate the birth of our Savior the tree amazed us with it’s magnificent display of colour. Each day the thousands of vibrant red petals falling from the top of the high, high, tree and cover the world with a fresh coat of colour. 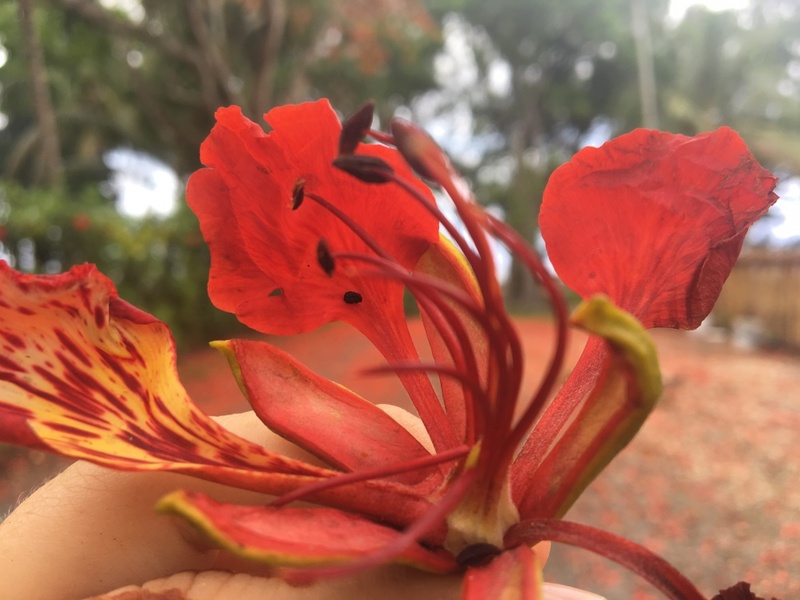 I bent down and picked up the delicate, rich blossom studying the black and yellow and red so intricately woven into the shape and colors of a flower. “Remember the worth of a soul is great in the sight of God” the scriptures were trying to teach me again. I thought back to all the times I had felt discouraged, downtrodden, and useless. My physical limitations preventing me from doing so many things I wanted to do, or my financial situation making me unable to give as much as I wanted to give, or endless nights awake with crying babies creating a hazy dissatisfaction with my role as mother during the day. When all the earth trusts, and obeys God so completely, why am I so impatient and filled with doubt? 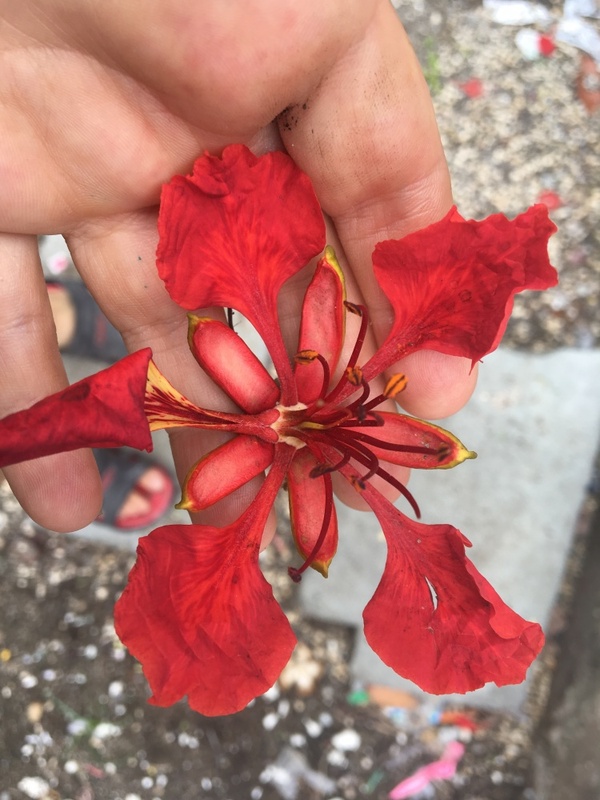 I looked down at the flower in my hand again, but this time noticed the dirt on my hands. I didn’t even remember how it had gotten it there, but now the camera was put away and there it was. Sigh…it always comes back to Jesus doesn’t it? For without Jesus there would be no atonement, and with the atonement each of us would be so burdened with unresolved Sin that we could never return to live with God again. 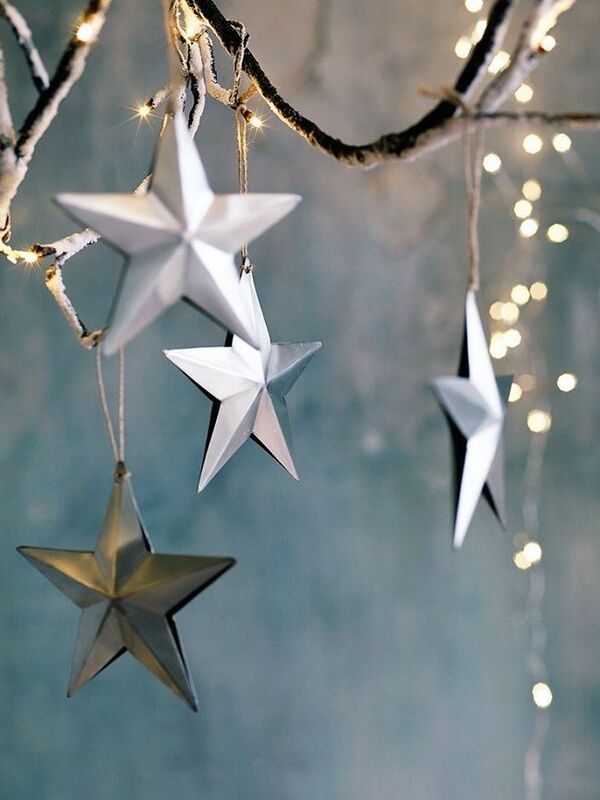 I am learning that like the Christmas tree, sometimes we must trust God and wait. It takes faith, and patience but I am guessing that if it’s anything like what is happening outside my front door, dirt and all, the results can be breathtaking, glorious and better than anything we could have imagined! I felt ashamed to admit that I didn’t know if I would even recognize him when I saw him. He looked so ordinary but something in my heart leapt when he came towards me with a smile and his hands outstretched and I could feel that he was not ordinary at all. This was an apostle of the Lord Jesus Christ, a specially chosen witness of our Savior and I was shaking his hand and kissing his wife. There were a thousand wonderful, brilliant things that I wanted to say but overwhelmed with the beauty of it my mind went blank. “Hi” was all I got out. That was lame….The fact that I was here at all was a miracle and I felt so blessed to even have this chance. 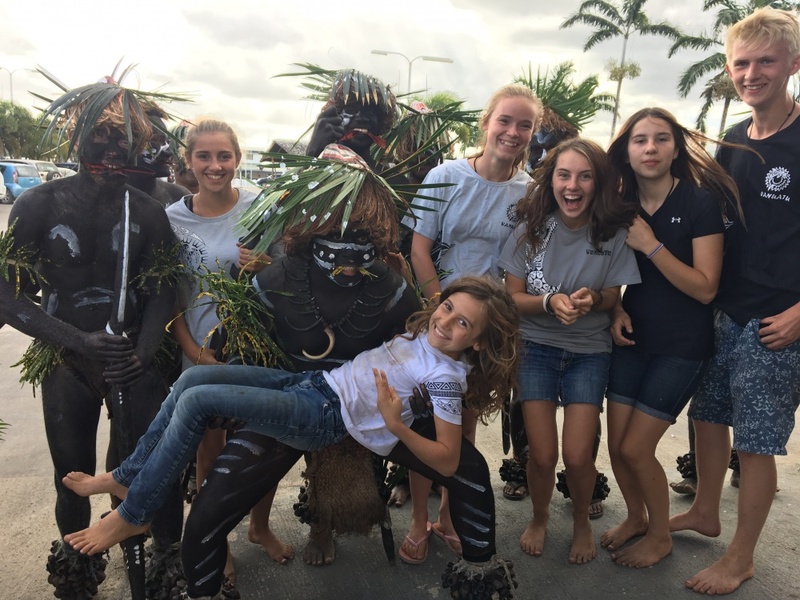 We found out last week that Elder Stevenson would be coming to visit Vanuatu. 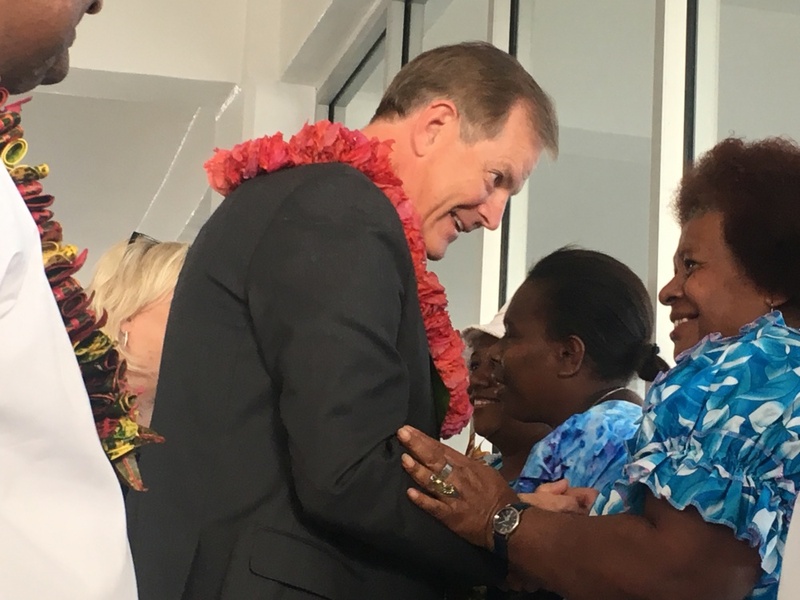 Just like in ancient times when Jesus Christ had 12 apostles on the earth, Elder Stevenson is one of 12 specially chosen apostles of Jesus Christ on the earth today. 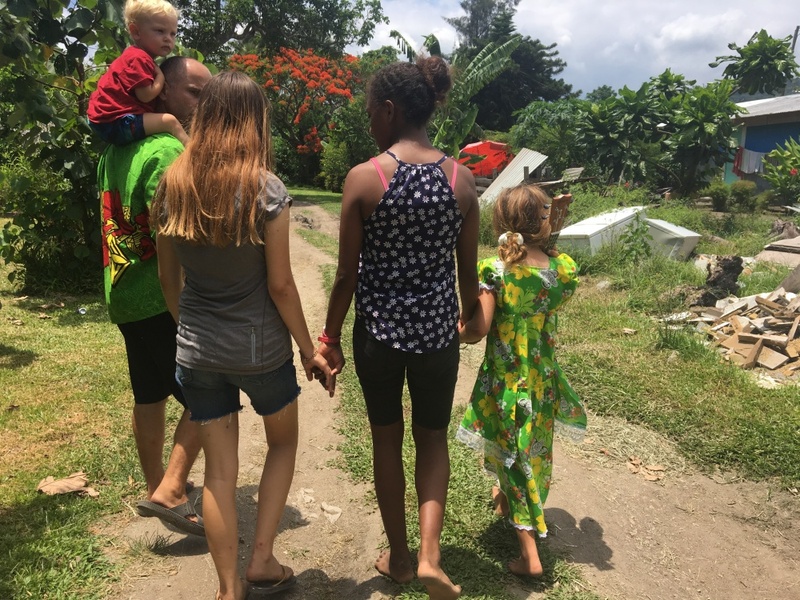 It’s been 8 years since an apostle of the church had come to Vanuatu so this was really special that we were getting this chance. It was planned that everyone would get to see him and listen to him speak during two planned meetings. One meeting for youth on Tuesday and one meeting for youth on Wednesday. None of us knew that he was going to be here today. The only reason I was even at the airport was because it was the day that my niece and nephew were leaving. They had flown in last month from Canada to visit us and now we had to say goodbye. Ethan is 18 and just received his mission call which is waiting in an envelope at home for him unopened. Both my niece and nephew were devastated when they found out that they had to leave 1 day before an apostle arrived. 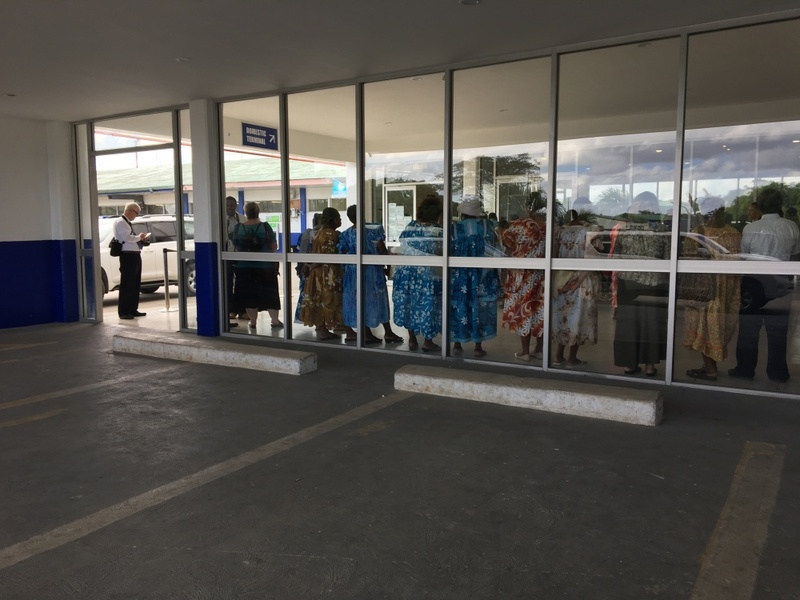 Because flights out of Vanuatu are all considered international you have to arrive at the airport 3 hours prior to departure. We didn’t really think this was a set in stone rule but learned the hard way a couple weeks ago when we dropped off a family member just 1 hour prior to departure and their plane had left them! This time we knew we had to come exactly on time. Our strategy was to check them in early and then spend time together walking around, taking pictures and hanging out until they really had to leave. Everything was going smoothly after the check in, but we couldn’t shake the feeling that there was something more going on. We noticed lots of shiny white cars, large men in suits and groups of dancers gathering around a particular area. It wasn’t too hard to guess that this must all be in preparation of Elder Stevensons arrival. He must be flying in on the flight that Ethan and Talia were flying out on. Suddenly we were feeling very excited. There was a small group of specially invited church leaders and their spouses behind the ‘Do Not Enter, VIP Exit Only’ sign. 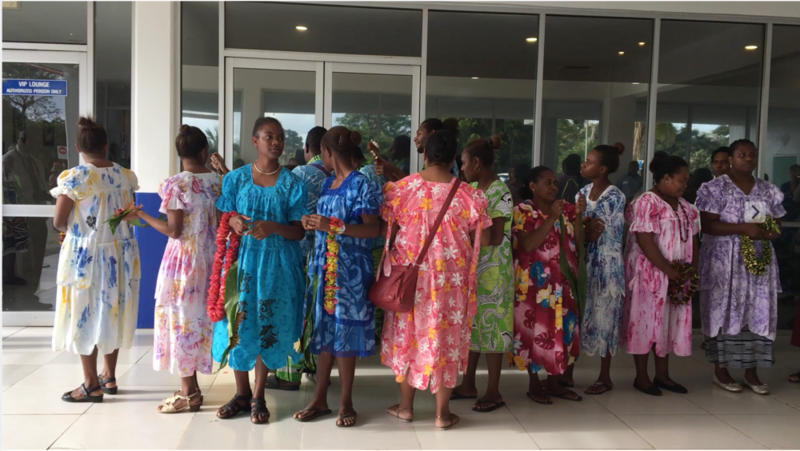 They were all dressed in their brightly coloured island dresses with fresh flower leis lined up nicely ready to greet the apostle. The men wore their best white shirts and ties some of them even had on suits despite the hot weather. We were on the outside looking in through the glass. Trying to stay back far enough that nobody noticed us but still hoping to catch a glimpse of the apostle. There were 9 of all together. My four daughters, four nephews and one niece. Unfortunately they were not dressed in anything other than what we wore everyday. Island t-shirts, cut off jean shorts and bare feet, of course they had bare feet. I at least had shoes on but was still wearing the grubby clothes that I had worked in all day. Gross, this was awkward. We briefly considered that we shouldn’t be standing around waiting to see an apostle in these clothes, but figuring that the kids flight would arrive before we actually got to see Elder Stevenson and knowing that we would probably have to leave anyways, we thought it couldn’t hurt. We waited and waited and waited and still no sign of anybody. We weren’t worried about the flight yet because we were just around the corner for where they would have to leave and we kept checking in to make sure they hadn’t begun boarding. Because the airport is so small there isn’t anything fancy like boarding announcements or computer screens displaying flights. The airport only fits one airplane anyways so you know that everyone there is for your flight. . We even took pictures with the dancers to pass time. The kids and I were hopeful that eventually if we waited long enough we’d get to see Elder Stevenson. 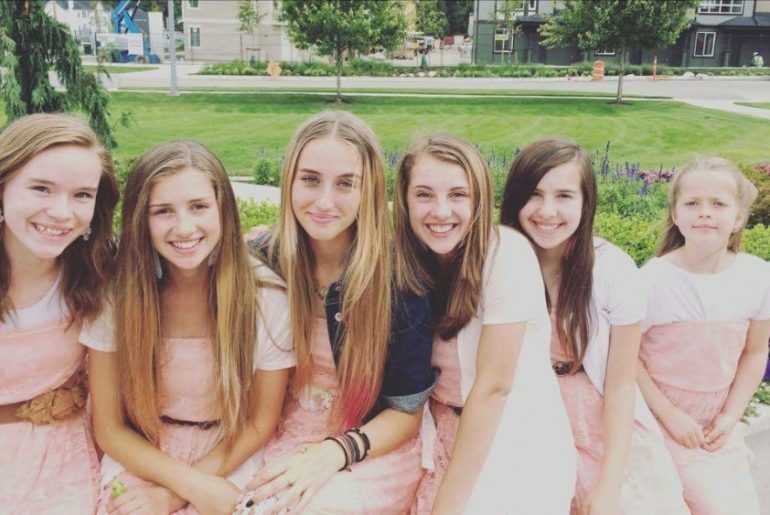 Feeling so self conscious about our presence there in the first place I lined up the kids a dozen times telling them if they stood just right or looked nice enough maybe Elder Stevenson would notice them and at the very least look at them and smile. But after an hour of waiting it was seeming less and less likely that we would even get to see him. Just as we starting to feel discouraged and preparing to leave, people started to gather around a little closer and excited chatter spread throughout the group. Naturally we also leaned forward taking a few steps closer. We were nearly up to the outside of the glass now with a great view of the door that the apostle was supposed to be coming out of. We must have looked eager, or desperate or something because totally unexpectedly one of the sharp men in suits approached us and asked “would you like to see Elder Stevenson”, He gestured behind the glass that separated us from everybody else as though he was inviting us to come in. I was sure I must not have understood him correctly and shook my head ‘no’. He asked again and I quietly explained how kind it was of him to offer but we weren’t invited, and even if we had been we certainly weren’t dressed appropriately to join the beautifully groomed, specially chosen group waiting to welcome a representative of Jesus Christ. The friendly man who I assumed was a body guard was gentle and kind as he insisted that ‘just this once’ it would be okay to not be dressed properly or have an invitation. I refused again, with a little less resolve and then finally the third time not wanting to be rude I thanked him and timidly entered through the glass gateway with my entourage of 8 very excited youth. Together we stood in the growing circle of welcomers. 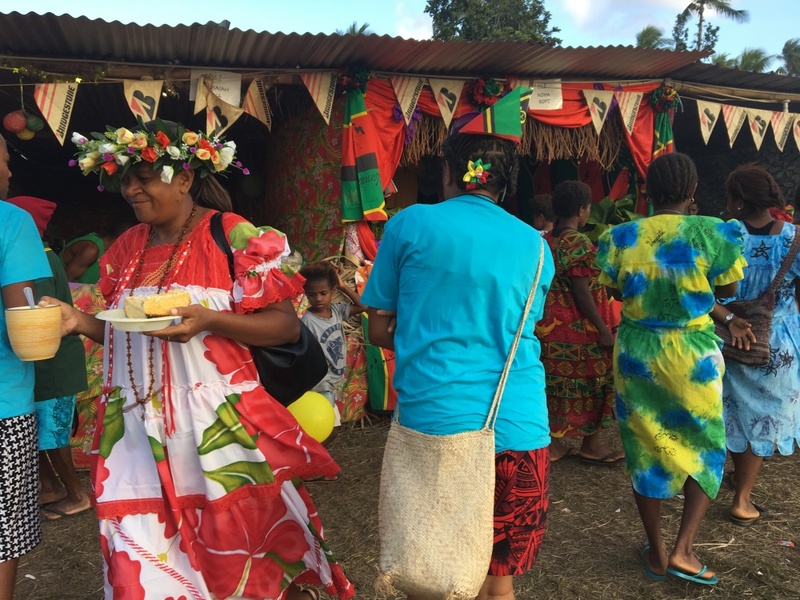 I looked around at the adult women in their island dresses, smiling and giggling like little girls as they waited. I saw full grown men with their arms folded reverently in front of them and husbands and wives standing next to each other holding hands, waiting together in happy anticipation. The feeling was electric, the spirit was so present and I was so happy that I had been at just the right place and time to be allowed to be here. Maybe Ethan and Talia really would get this chance, something that happens once in a lifetime to shake the hand of an Apostle of God. I felt peace. I knew this wasn’t what we had planned, the situation wasn’t ideal, but I knew it was meant to be an it was okay. Nearly out of nowhere the feeling of peace left me and another feeling replaced it. This thought was louder, stronger, more persistent. I looked down at my blue knockoff Adidas sport shorts that were splitting apart at the seems. Honestly and truly splitting apart. My shoes were too big for me, my hair was messy and my old t-shirt was a dirty. What was I thinking? I was suddenly humiliated, I knew I didn’t belong here. I needed to get out and quick. I tried to tell all the kids that we all should leave, and we weren’t dressed properly but they wouldn’t listen to me as they stayed firmly planted in their spots. I quietly edged my way towards the door and snuck back outside. Phewph…Feeling much more comfortable, I relaxed as I looked onward from the outside hoping to go unnoticed. Only a few minutes had passed when a nice looking, well dressed gentleman with a camera came and stood beside me. He didn’t say anything for a few minutes but then softly asked why I wasn’t standing with my kids and the others inside. I was embarrassed as I explained that I was not prepared to meet an apostle in the clothes I was wearing and felt quite out of place. He turned to me with a knowing smile and said “ You go back there” he gestured to an empty spot in the line up, “you can’t miss this chance to shake his hand, and if I know anything about the brethren of the Church it’s that they certainly don’t care what clothes people are wearing, they’d much rather be in jeans and t-shirts themselves”. He was right. I did not want to miss this chance to shake his hand, in fact with all my heart I wanted it. 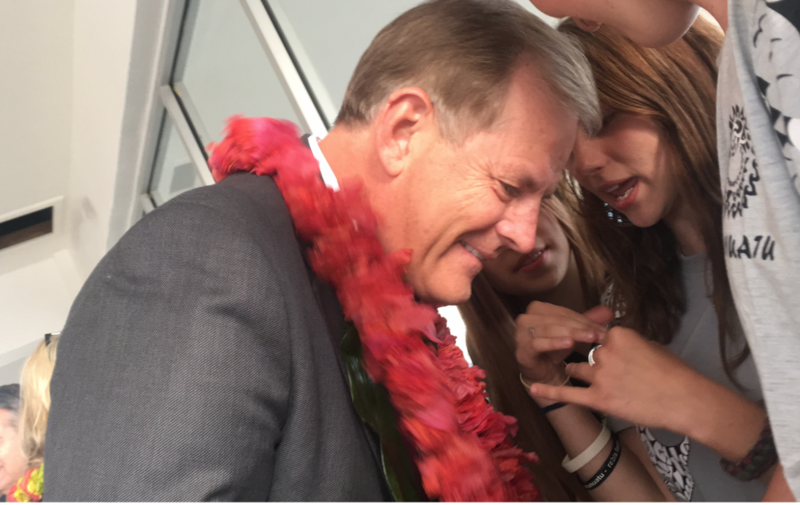 Since the moment I found out that Elder Stevenson was coming to visit I had hoped that we might get a chance to meet him. I thanked my new photographer friend for his encouragement and took my place again amongst the other excited Saints inside. The knowledge that Satan wants us alone in the dark and Jesus wants us together in light struck my heart. I was meant to be in the light with all these God fearing, beautiful people around me. It isn’t my shoes, or my clothes or even my sins for that matter that define who I am it is my heart. And with all my heart wanted to be in the light. Ethan, my nephew came to stand beside me, he whispered “Aunty, is it time yet, when do we have to leave for our flight” oh ya, their flight. I had forgotten about that. I knew we were already cutting it close. “Boarding closes at 4:05”, I told him as I looked down at my phone, it was 4:03. My heart fell, it was too late for him, he needed to leave. “Ethan, you’re going to have to go without meeting him,” I whispered urgently. “Are you kidding me? No way, I’d rather miss my flight than miss meeting the apostle”. Why was I not surprised. Since his birth Ethan has been incorrigible, impossible, and terrible at taking no for an answer. I turned to argue with him, but just at that moment the doors opened and there was a hushed silence that fell over the crowd. There he was. Elder Stevenson came out the doors. (I was happy to know that I did recognize him) And at first he looked so ordinary but the closer he came the more I felt a spirit of absolute truth whisper to me that he was not ordinary. 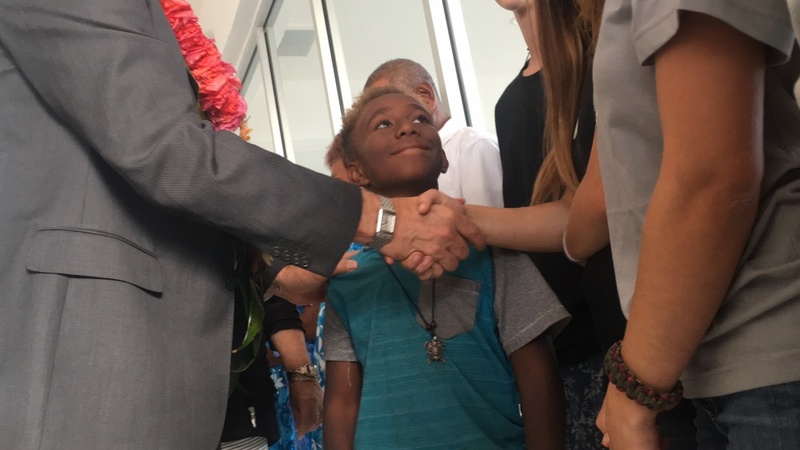 He was showered in leis and kisses and with a warm smile and enthusiastic energy he went around the whole group shaking each persons hand, asking them their names, who they were and what they did. Ethan’s surprise at being called by name registered on his face immediately as he turned to answer Elder Stevenson. Turns out one of the reporters that had been taking pictures and visiting with Ethan beforehand had told Elder Stevenson that there was a young man just flying home to open his mission call with his family. The contagious smile that gets Ethan out of all kinds of trouble spread across his face as he responded enthusiastically “yes I am!”. Elder Stevenson asked all kinds of questions as he visited with the kids as though there was nothing better to be doing in the world. I couldn’t stop the tears. A feeling of love and peace was just all around this man. After Elder Stevenson and his wife moved on I looked down at my phone. 4:20- shoot, I had to get those kids out of there. Their plane would be leaving in minutes and if they weren’t on the flight I knew my sister would hate me forever. I grabbed the kids, and their bags and raced passed the crowds. There was literally nobody there, it was completely empty. We flew down the sidewalk and through the airport, there was literally nobody there. The lobby was completely devoid of people. Oops. We gave our last kisses and hugs and shoved our niece and nephew through the security gate. As we were walking away thinking about everything I suddenly heard a pounding on the security glass beside me. I was already outside the airport, but apparently I was actually on the other side of the security gate. I looked through the darkly tinted glass and saw Ethan. “Aunty Becky” he was mouthing the words “ They won’t let me on the plane, I didn’t wear shoes.” SERIOUSLY??? That was just like my nephew… I ran back down the sidewalk and through the tiny airport as quickly as I could, I took off my shoes and threw them as hard as I could through the security door. Ethan caught them with a silly grin, slipped them on his feet and disappeared around the corner. 37 years ago today, the combined governments of both England and France agreed to give Vanuatu its independence. (How generous, right?) 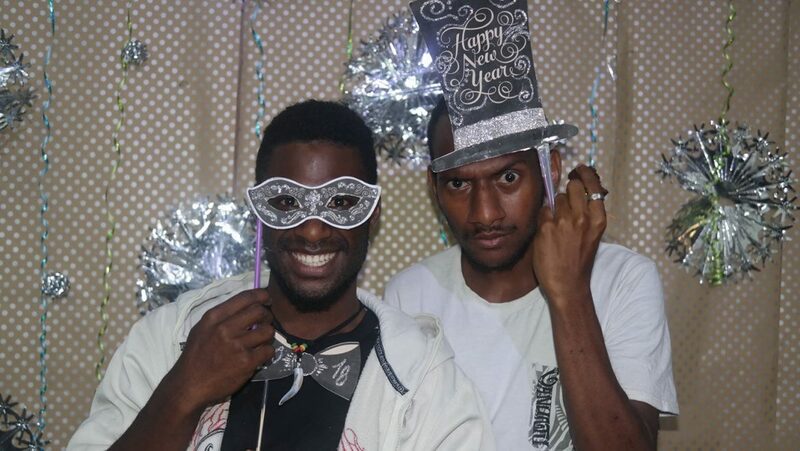 Vanuatu does not take it’s independence lightly. It’s been non-stop parties for the last 7 days. (Trust me, I know, I’ve been at all of them) Music, Dancing, Kakai (food), Wrestling, pig wrestling, Karate, Soccer, Basketball, Boxing, Singing. There is an never ending list of talents that are on display for the 8 days celebration. It goes from early into the morning each day to early into the morning the next day. Live music ends somewhere between 3:00-4:00am and then starts again between 6:00-8:00am. The entire thing is broadcast via 6 massive speakers. You don’t even have to be anywhere NEAR the celebrations to HEAR the celebrations!! Entire villages show up to enjoy the festivities and little children and old grandmas share woven grass mats that are strewn across the field for days on end. It’s quite a site! 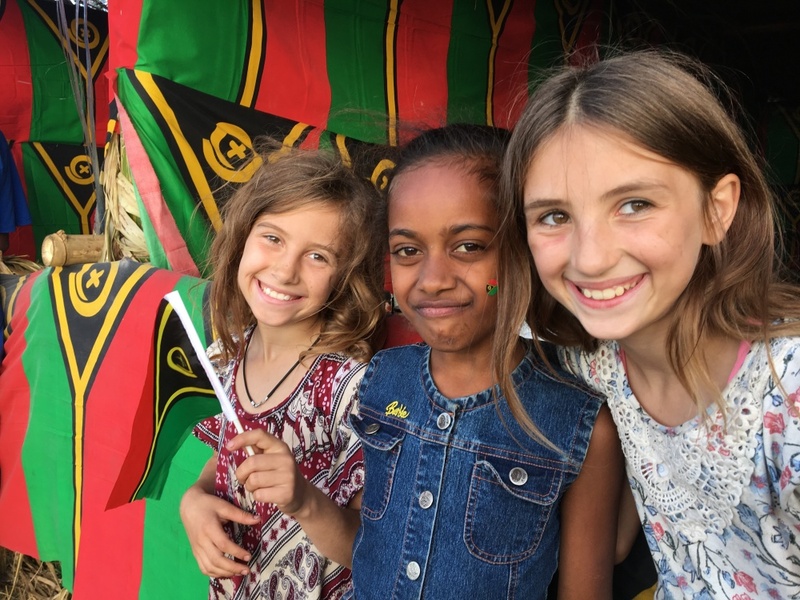 Because of all the celebrations, our local church leaders asked each group of saints to meet as early as possible, so that families would be able to participate in the community celebrations for the day. Our branch chose 7:30. Yes that’s 7:30 AM! Did you even know that you were allowed to meet for church at that time?! There weren’t as many people as usual this morning at church. LOL. But for those of us that were there it was a treat. Sister King gave talk that was really special. She talked about a story that she heard last week from president Basille (he’s the leader of the local church branch we attend). 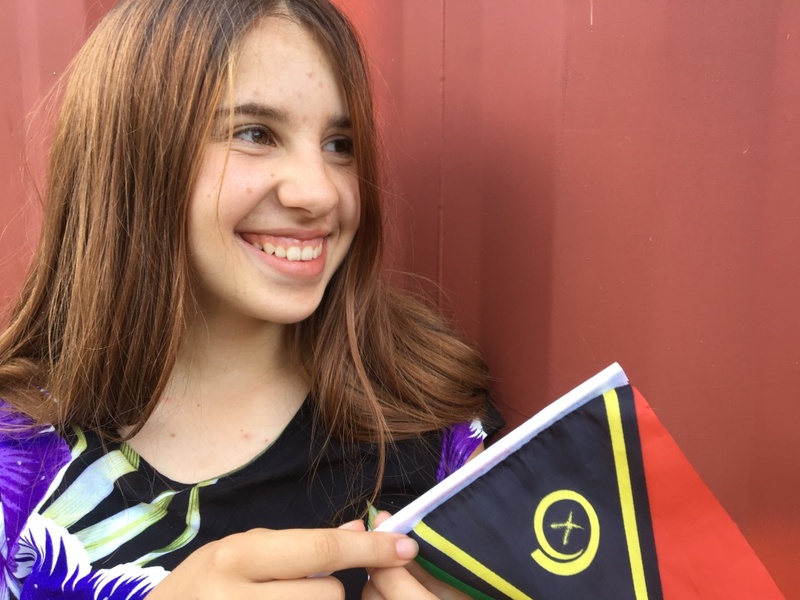 President Basille said that 44 years ago there was no Mormon church on any of the islands of Vanuatu. 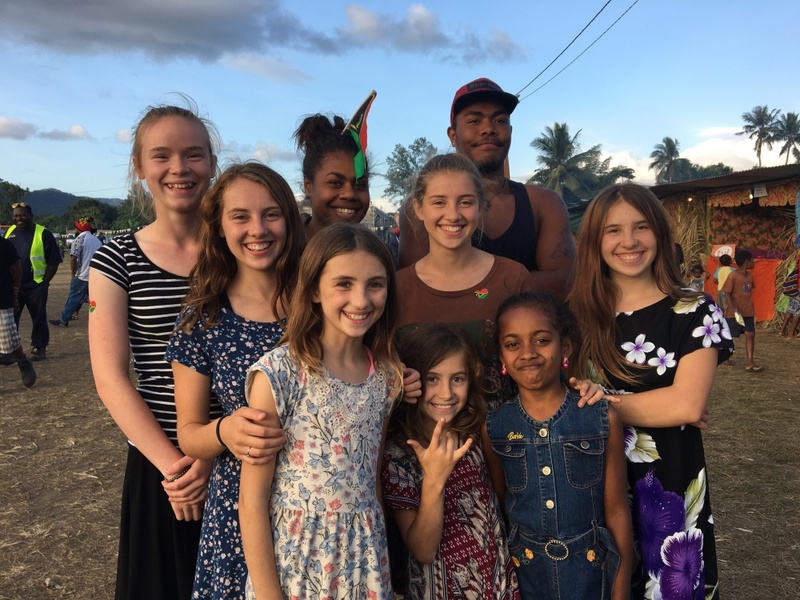 After prayerfully considering the possibility of sending full time missionaries to Vanuatu, the church leaders determined that that is exactly what God wanted. 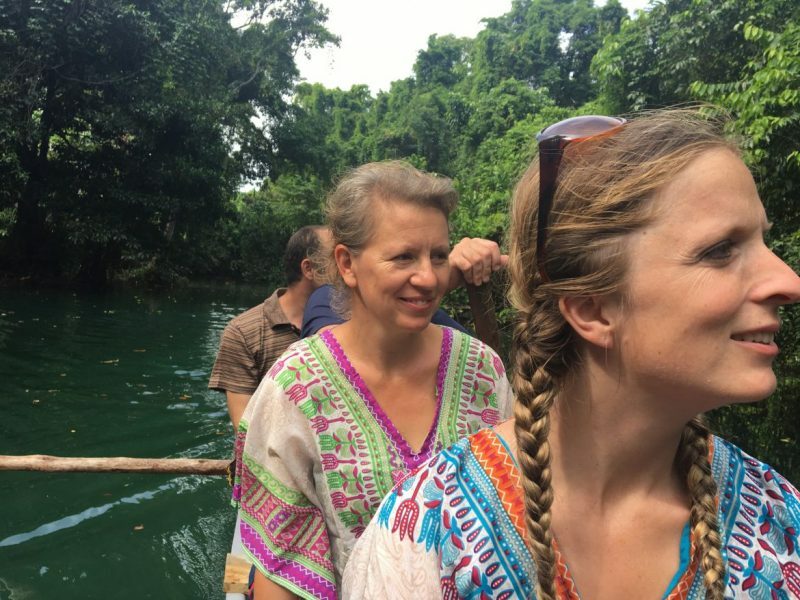 They gave the assignment to an LDS French ambassador to come to Vanuatu and meet with both governments to ask permission for the Mormon Church to send missionaries. 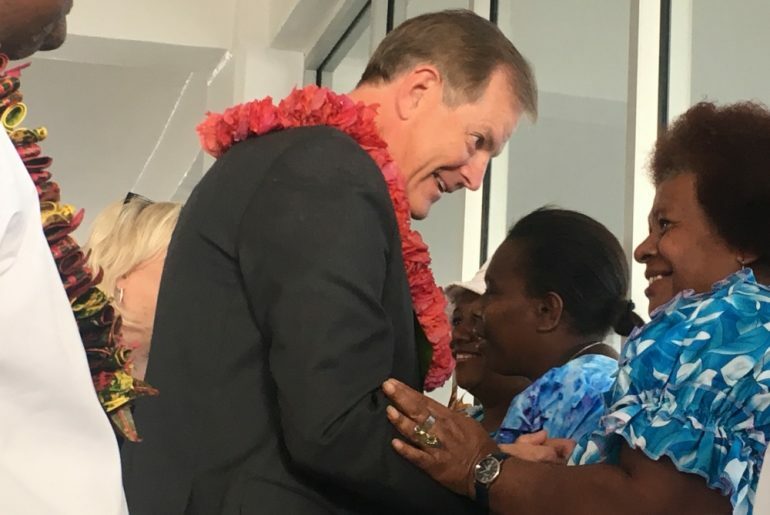 When the LDS ambassador arrived in Vanuatu his meeting with the English government went well and they agreed to allow missionaries. However, the meeting with the French government did not go so well. 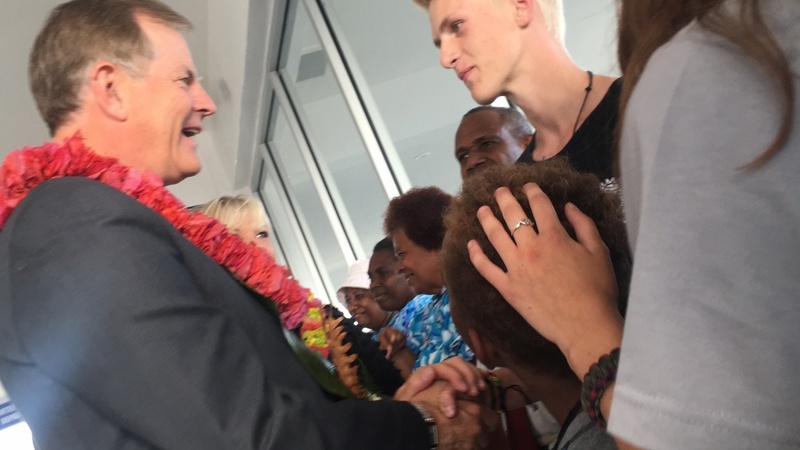 The government official representing the French government was rude and disrespectful to the LDS man telling him that there was absolutely no way that missionaries would be allowed to preach in Vanuatu. 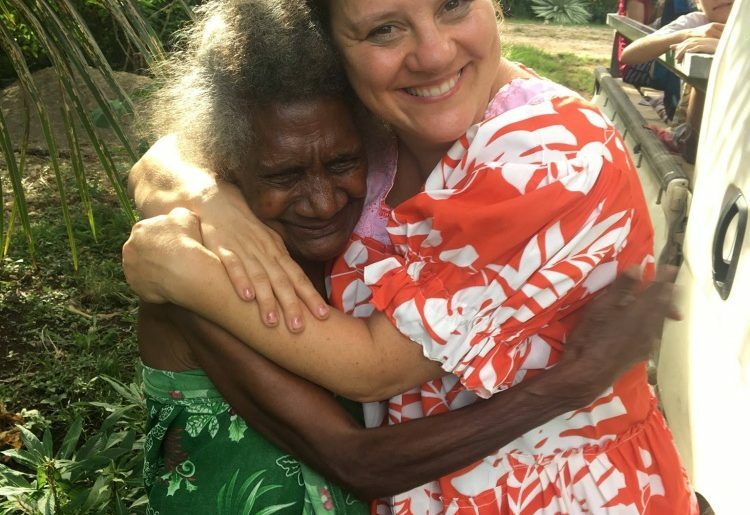 Discouraged, the LDS ambassador went home and reported to the church that they would not be able to send missionaries to Vanuatu. 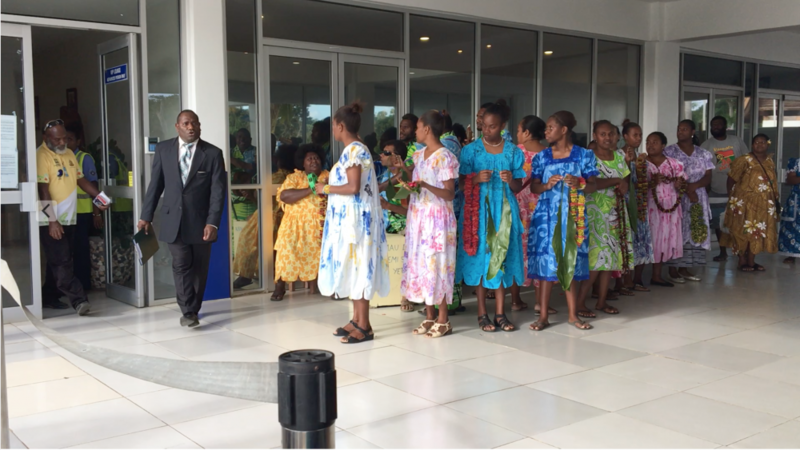 Several months later the French LDS ambassador was back in Vanuatu on business of his own. As he was finishing up his business he felt like he must go and visit the French government official again. He wondered at this feeling due to the very rude way he had been treated last time, however, determined to follow this prompting he made an appointment to meet with him. To the LDS ambassadors great surprise the French official was overjoyed to see him. He was very kind and welcoming and invited him to sit down with him for lunch where they could talk. 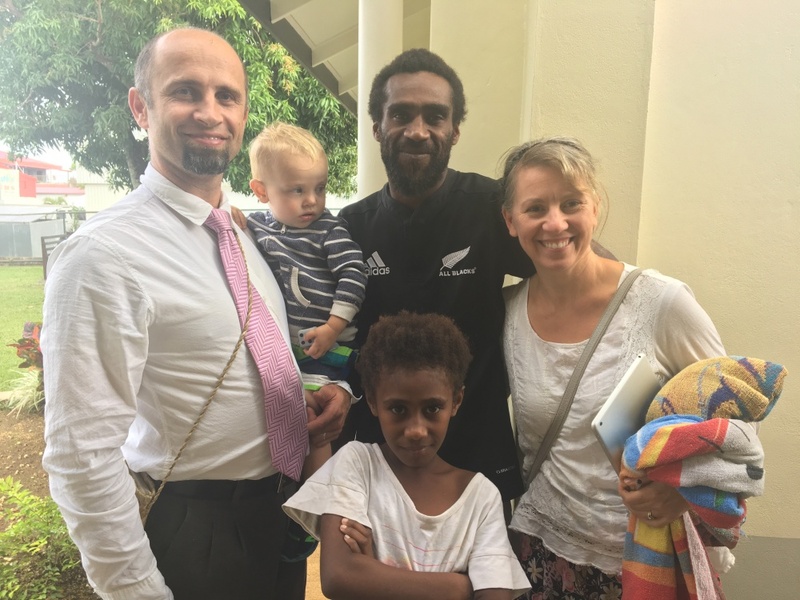 After just a few minutes of visiting the French official gave his official invitation for the Mormon church to invite missionaries to come to Vanuatu. The LDS ambassador was stunned by this sudden change in attitude. 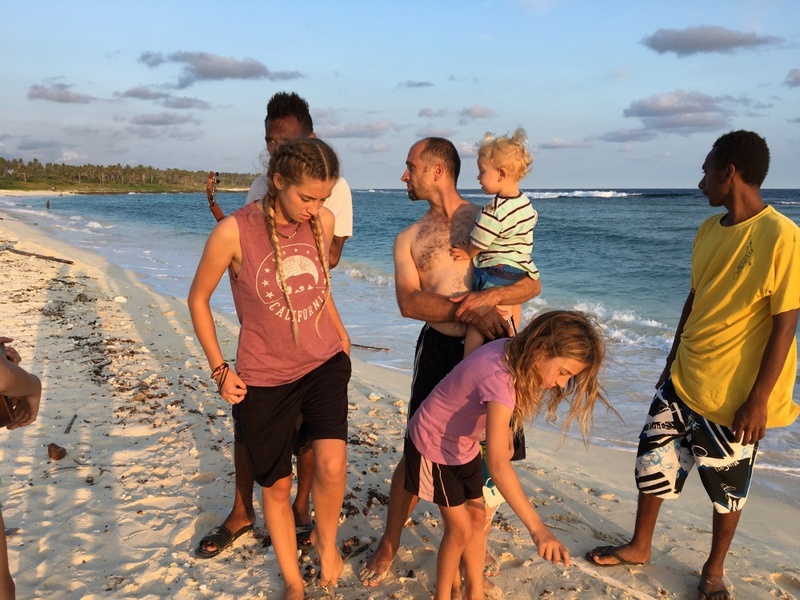 He finally had the courage to ask the French official “Why are you allowing us to have missionaries in Vanuatu?” The official replied “When I last left Vanuatu I had to walk to work everyday. Each day I passed a beautiful church building that said ‘The Church of Jesus Christ of Latter-Day Saints’. The people were always smiling and saying hello to me. They planted gardens and made the area clean. They had many activities and were always respectful, getting involved and helping out in the community, making it a better place to live. Every time I saw people go in or out of that building they were filled with a special light and happiness that I’ve never seen anywhere else. 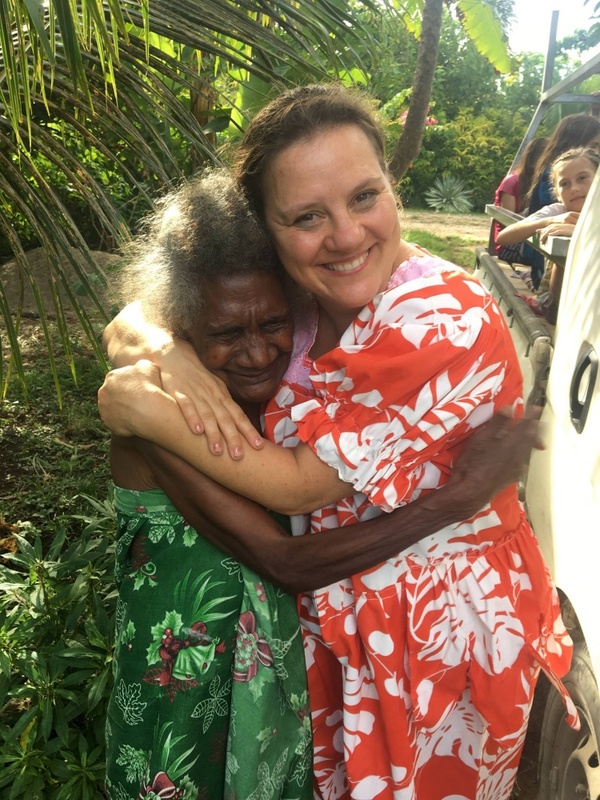 If we have missionaries in Vanuatu will they do that here as well?” The LDS ambassador assured the French official that they would do that here and ever since then missionaries have been allowed in Vanuatu. Isn’t that such a beautiful story? There hasn’t been a Sunday that goes by that at least one or two or three people are getting baptised. 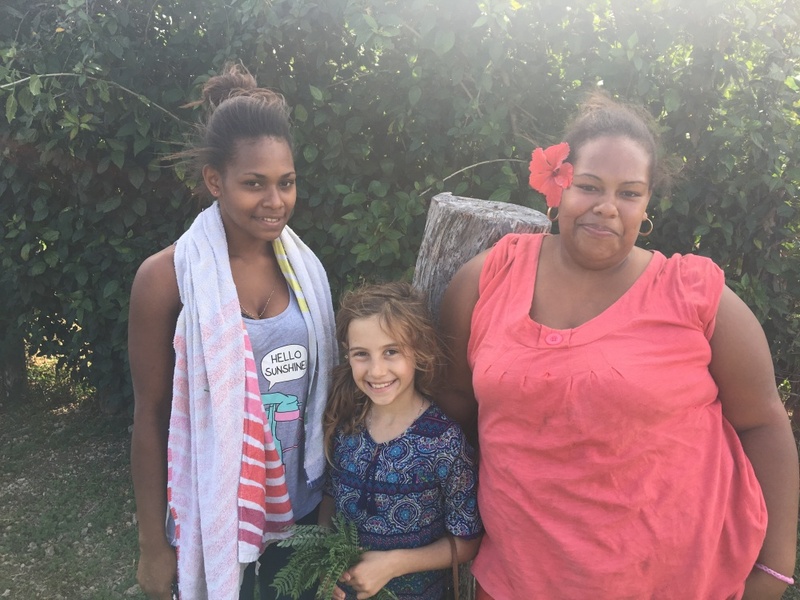 Our little branch on the island of Efate is growing faster than we can fit inside the building. On the other islands the church is welcomed with open arms as well. 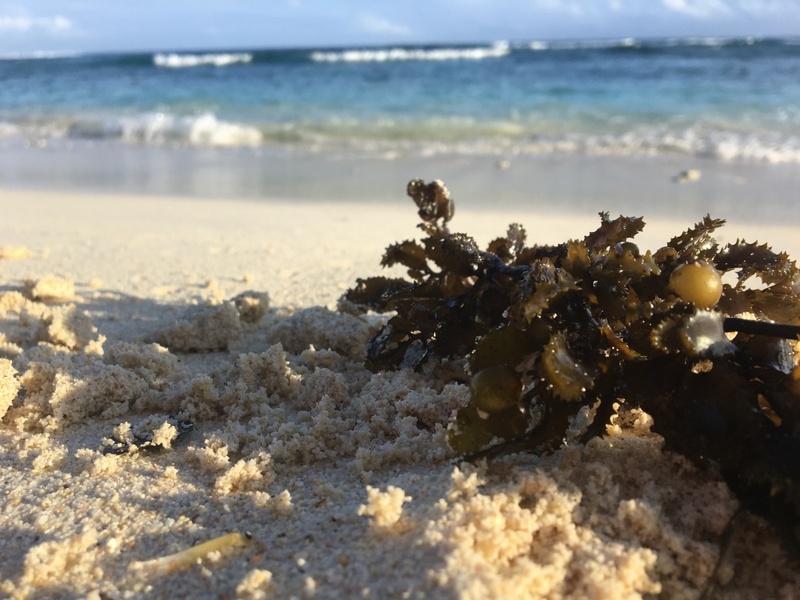 One man I met on the beach last week explained one reason why this is the case. Jacob’s family was from Tanna- they knew Nathaniel’s mother (that’s my nephew). 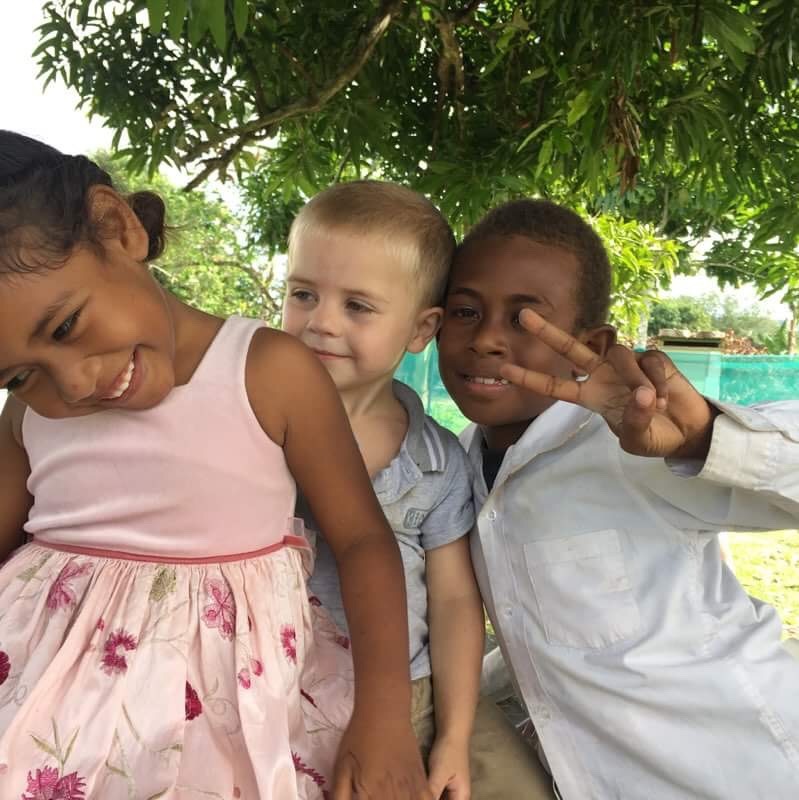 He said that after Cyclone Pam (an absolutely devastating cyclone that flattened the island) there was many aid organizations that came in to help our their island, but there was one that came first and left last. They wore yellow t-shirts and they delivered shipments of food, water, money and supplies. They not only rebuilt the houses of their own members but they rebuilt the houses of entire villages. Now, whenever someone finds out that someone is from the Mormon the church, they kiss them and hug them and thank them. And many, many people have joined the church because of that. Of course our goal is not for people to join our church, our goal is to share the good news of the gospel of Jesus Christ and allow it to change hearts and lives in others as it has in us. 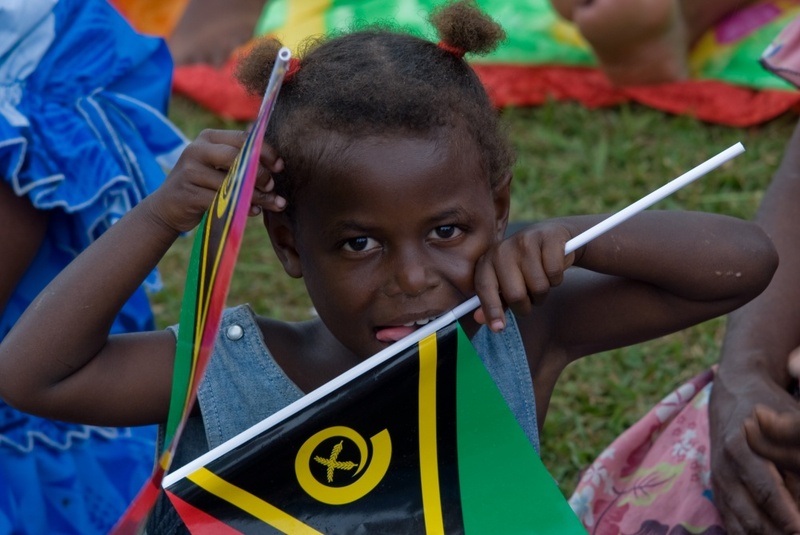 Watching the way Vanuatu celebrates their independence humbles me. 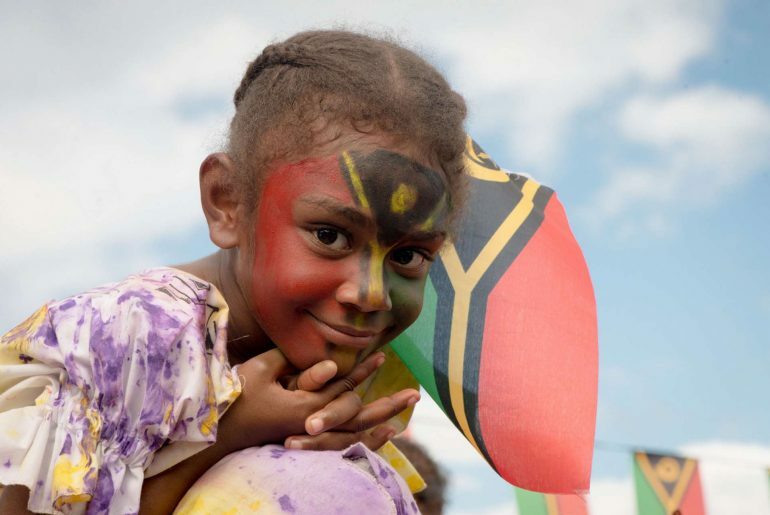 These island people are truly, emphatically, and deeply grateful for their independence. They know that the only way to be truly free is to be with God, and they are. And so today, because church was over so soon, do you know what the entire island is doing? They are raising their flag together, and singing their anthem together, eating together and then they are going to listen to 10 hours of preaching together. Yes, that’s the activities for the entire island. Every store is closed and every family is on their mat in the big field. And it doesn’t matter which church you belong to because today everyone is together worshiping God through those same 6 big speakers that have been blasting out music for the last week. True independence comes from knowing who you are. True independence comes from recognizing that every man is and every woman is your brother and sister and that Pappa God really is our Father, all of us. 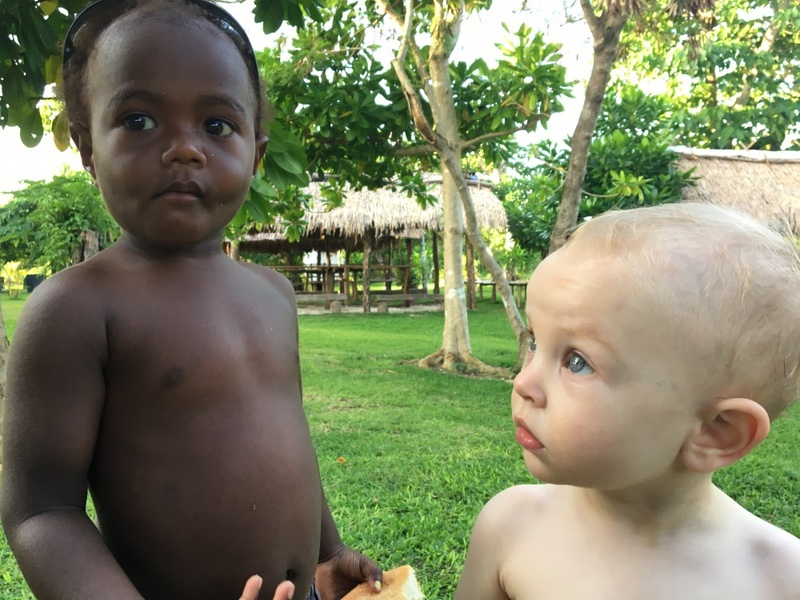 God doesn’t see as Mormons or Catholics or Muslims, or as black men or white men, he sees us as His children. The message from the preacher in park today was that as brothers and sisters we need each other. And we need to be our best selves, so instead of focusing on the mistakes from yesterday or last year we need to take care of being the best that we can be today and unite in our respect and honor of God. Gods Perfect Plan of Happiness For Our Family Includes My Teenagers! “You are ruining my life,” she shouted as she slammed the door behind her. Now both my teenager daughters hated me. The one because I was taking her away from all her friends, and the other because I was preventing her from earning money for college. Just a couple hours later, and only one night before we were supposed to leave on our big family adventure, my daughter ‘borrowed’ the car, and with her little sister unbuckled beside her, she turned on the music and took off down the gravel road. It was only minutes before she started skidding across the loose gravel. She was going way too fast and by the time she realized it, it was too late. The car swerved as it careened off the road and flipped into the ditch. ‘Breath deep mom, you can do this’, I told myself again. God was watching out for my daughters that night because although the car was damaged badly enough that it couldn’t be driven, miraculously they were both without injury. I prayed and asked God again to give me strength to go through with this. With the extra financial burdens that had been placed on our family over the last year, (since Eric fell off the roof and shattered his foot), taking our family on a trip half way around the world was clearly not practical. 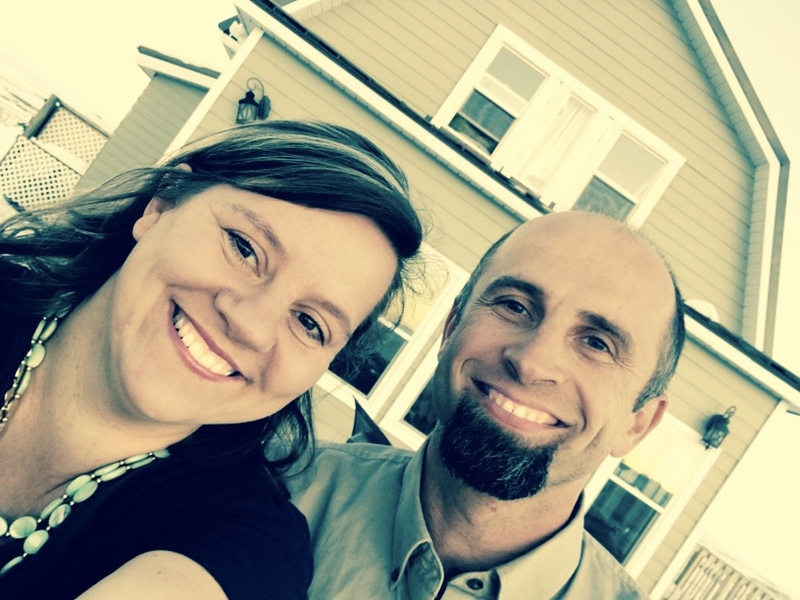 Financially speaking, the timing was all off, but emotionally speaking it was just what we needed. Friends and family by dozens pulled me aside to give me advice and shed light on the obvious flaws in my plan. ‘Your kids could get raped’, ‘you might catch an infectious disease’, the ‘you can’t just stop your kids schooling in the middle of the year’, ‘wait until you have more money’, ‘go somewhere closer’, ‘don’t go for as long’. Then there were my own fears ‘how will we pay for it?’, ‘what if the kids react to the vaccinations?’, ‘what if your daughters won’t come with you?’ ‘What will we do when we come home’, ‘We can’t speak the language’, ‘What if we have a medical emergency?’ They were all valid fears, but that was just it. I refused to make my decision based on fears, and inside I felt something urging me to do this. The expedited American passports we ordered months ago had still not come in, and less than a week before we were supposed to leave we decided to drive to Calgary and get last minute Canadian ones printed. At this point- where every penny counted, the extra $600 seemed like a big price to pay for something we might not need (we were sure those US ones would arrive any day) but we did it anyways. It’s been 4 months and those American ones still haven’t arrived! The Canadian ones ended up arriving the night before we were to fly out, the night my daughter flipped over the car. I was sure that the stress couldn’t get worse. I was wrong. 5 days before we were to leave we accepted an offer on our house. This gave us less than a week to pack up the entire thing and get it ready to change hands. It was a crazy thing to do but it felt just right. My kids NEEDED something different. They needed a place to find out who they were without all the pressures and expectations of our North America society. Our family needed a break, some time to just BE together and block out the world. Endless texts, tweets, phone calls, Instagram stories, FB Messages, Disappearing Snap Chats…it was all just taking it’s toll on us. I knew that God had created me to enjoy life, but I wasn’t enjoying life at all. I was stressed out and depressed and unhealthy, and so was half my family. Things just weren’t going the way I had always imagined my life to be, and I wasn’t ready to give up. No, I really believed that our family had a mission, and in order to accomplish that mission we needed to DO something together. Not just something ordinary, but something CRAZY, something BIG. My little kids were easy to convince- you know how trusting young ones can be. My husband loved the idea, but wasn’t sure how we could possibly pull it off, and my teenagers down right hated IT, and now they hated ME! In fact there were SEVERAL times when I was sure that one or both of them would run away before we had a chance to even step foot on that plane. We compromised and instead of going for a year we decided to go for just 4 months. 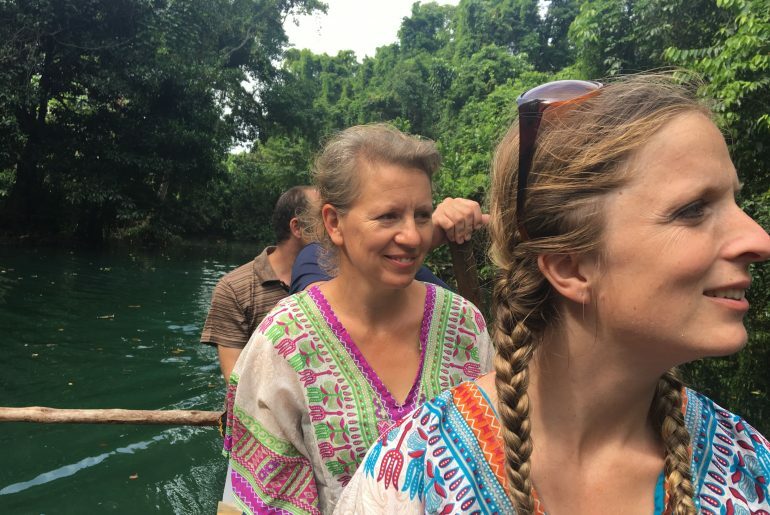 Instead of going to a 3rd world country where they didn’t know ANYBODY we decided to go to a 3rd world country at the same time as two of my siblings and their children. And instead of living in a tin shack, like I had wanted to, we found the perfect house on the beach right beside my brother and sister. I tried to sell everything I could possibly think of to earn extra money as we carefully prepared for our trip. People on our local buy and sell saw the stuff that we were selling and started asking me questions . I was scared to tell people what we were doing. I was worried that if I told people what I was doing and didn’t end up getting enough money to actually do it, then they would make fun of me. I was wrong. For the most part the people around me were wonderful. When they saw how serious our family was about going they really pulled together and helped us out. Neighbours helped us mow our lawn and pack our house, friends stopped by with meals, and teachers worked extra hard to help us creatively let the girls finish courses and take tests early. Honestly, this wasn’t anyones dream but mine, and a million times I questioned the rationality of it. WAS I going to ruin my kids lives? Would it REALLY be a disaster? I just kept hoping that God would bless this dream of mine and make it all work out. 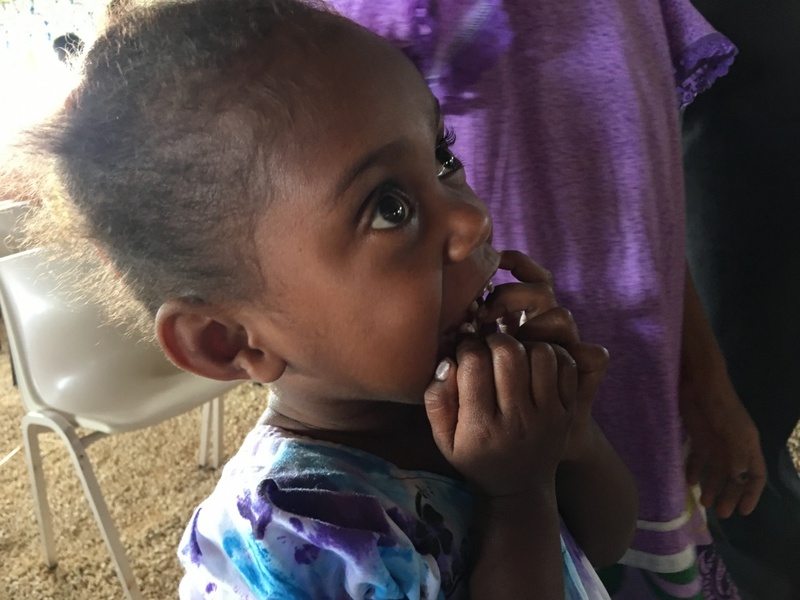 For the first month we were here in Vanuatu, Analaea, Eliza, & Mireyah were often in tears. They hated it. They hated the bugs, the heat, the language barrier, the food, all of it. I felt terrible. What had I done? I kept praying that God would take our hard work and our sacrifice and He with His infinite wisdom and grace would purify it and magnify it. The online work that my husband was supposed to be able to do here didn’t work out. Our expensive, brand new Mac computer suddenly wouldn’t turn on, and the internet was too slow and unreliable even if it had been working. That meant that money was tighter than I had hoped it would be. One month had passed and everyone was still pretty discouraged. After infectious diseases, dog bites, boils and blisters we were getting tired. There wasn’t much to keep Eric and I busy, we didn’t have enough money, and things didn’t seem to be improving with the older girls. I had hoped, and prayed so many prayers that things would be better here. That people would be happier and that our family would discover its purpose. Of course, after all these years I am still so slow to learn. I just needed to quiet down a little and exercise some PATIENCE and FAITH. God’s timing has always been perfect, and when He is ready to bless us, He blesses us! And when He is ready to show us His vision, He shows us His vision! I can’t identify which minute, or hour or even day it happened, but slowly, gradually it did happen. The MAGIC, the MIRACLE and the BEAUTY of God’s plan unfolded and one by one it changed our hearts. God took our tiny dreams and made them big. He sent wonderful, happy, friends who spoke English into my daughters lives. And he sent people ready to learn about God, and he sent people who needed service and love into our lives. 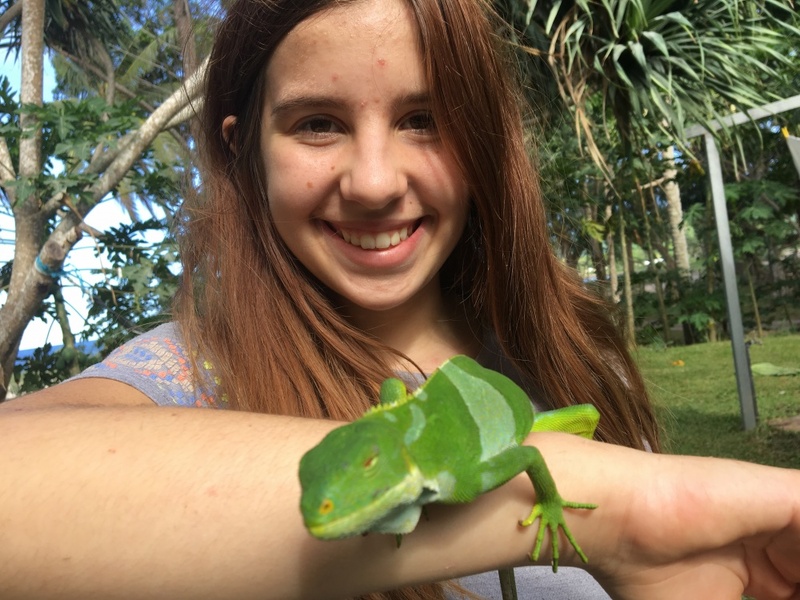 He sent an iguana and a baby chick into my 13 year olds life which made leaving her horses and cats just a little bit easier. 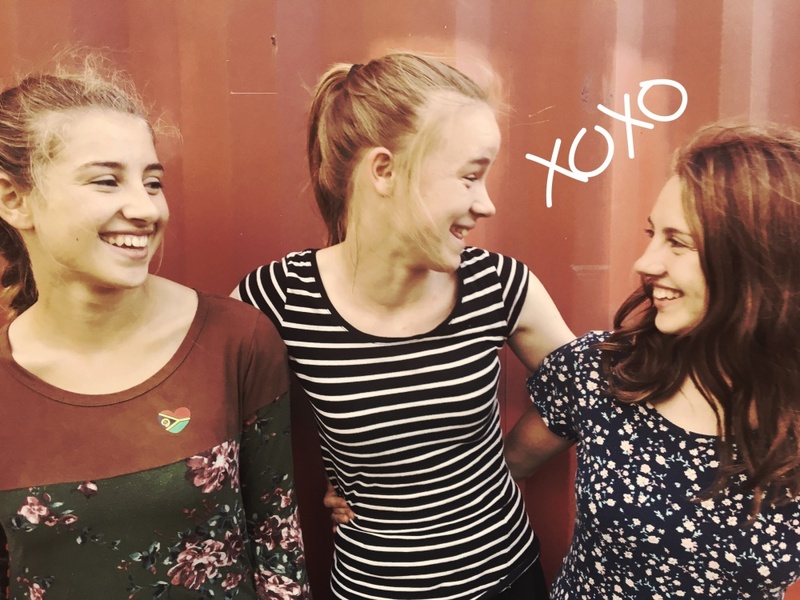 We have been here for 3 months already, and my 17 year old doesn’t ever want to leave because she loves it here so much, and my 15 year old spends her days smiling a bit more often while she teaches an 18 year old how to read who never had a chance to go to school. Our little boys get filthy while drawing pictures in the dirt with their best friends whose skin is brown, and although they don’t speak the same language they understand each other perfectly .And our whole family laughs or argues as we sit in the hot sand or go for a swim under the stars at night. There is no doubt that God loves us. That He knew that this was just the right time and just the place for our family to come. And all those tears, and all that money and all that sacrifice was worth it. And even if we get blown away by a cyclone or swept away by a tsunami, or attacked by wild dogs this is an experience that was meant just for us and it’s perfect not because WE are perfect but because GOD is perfect! Hey Guys, I had so many positive responses from my blog post about our trip up the river that I decided to make a movie 🙂 Enjoy! There are not even words to describe the perfect day we had today. As we flew down the road yesterday bumping along in the back of the truck we saw beautiful canoes all carved in the custom style lining the road. The sign said blue hole and our driver told us that if we paid 1000vt ($10USD) then we could have a ride up the river. It sounded pretty fun and so today when we passed the canoes again we stopped to take a ride. A rusty chain hung around the gates and nobody was to be seen. Not to be discouraged our driver said he knew where the owners would be. So we went on a bit of drive checking in and out of different village houses until we finally found someone who knew where the owners were. I guess they were napping in the grass. After explaining that we would like to canoe up the river on one of the boats and paying him the advertised fee we all climbed in. It was simply amazing! Once we got settled and the chatting and laughing subsided, (with our group that rarely happens) Ben (our guide) paddled us up the river. It was like magic. The birds were singing in the trees and the only sound was the paddle hitting the water. The words running through my subconscious brain spilled into my consciousness. Peaceful. Tranquil. Magical. Sacred. If nature could pray it was like witnessing the prayer of the earth to Papa God. It really was a extraordinary. We got further and further into the jungle and now vines were dangling in seemingly mid air with oversized pods and spiders and other creatures living with them. The white sand of the river bottom was visible the entire time and schools of tiny fish made appearances here and there, dancing around the boat and going on ahead without us. After probably 20 minutes of paddling, and much sooner that we wanted we turned the corner and there was the blue hole. 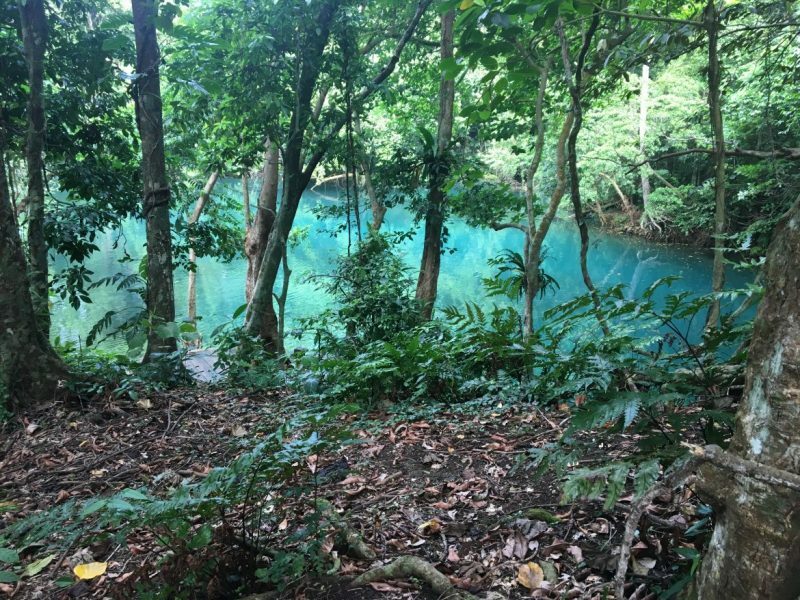 A glistening pool of deep turquoise blue in the middle of the jungle. 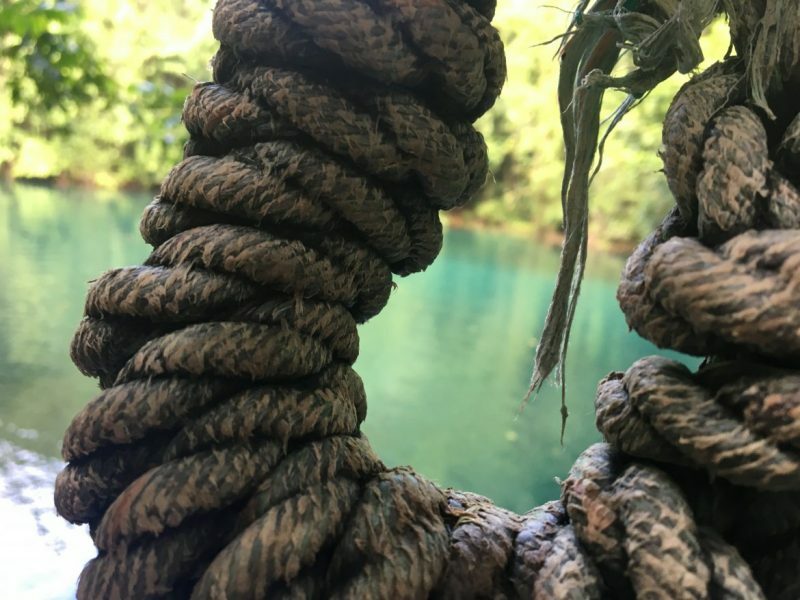 So out of place amongst all the greens and browns that we had been seeing, the blue hole looked like a secret hiding in the forest. 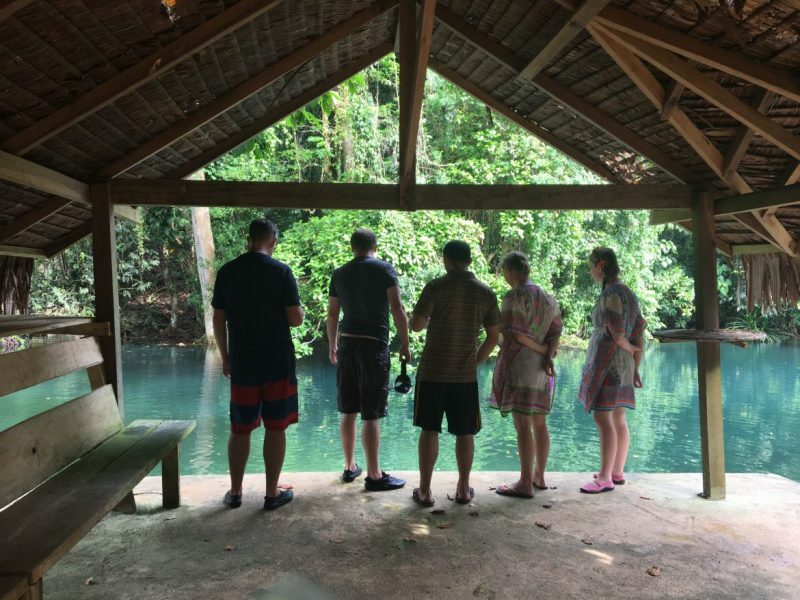 After playing, rope jumping, feeding fish and exploring the surrounding gardens and paths we persuaded Ben to take us all the way down the river and to the open ocean. It was nearly just as beautiful as our trip up the ocean and a few times during the trip Dan or Eric or Lindy burst out in song unable to express the reverence for the surroundings in any other way. Sometimes I wonder what it would do for the soul to be constantly surrounded by so much beauty. It certainly agrees with my soul! I also considered how lovely we thought the river was and not knowing what was at the end of it, all of us could have happily stayed and played in the shallow pools all day. However, just like God’s plan for us, He knows what is ahead, and He has much greater, and grander plans for us than we could ever imagine. How could my life be transformed if I would quiet down for while and trust in the Almighty? Late last night my 15-year-old came into my bedroom to sit down and chat. There was rarely time for this back at home, however, with no TVs or computers, iPods or radios, Island living somehow makes space for beautiful things to grow. 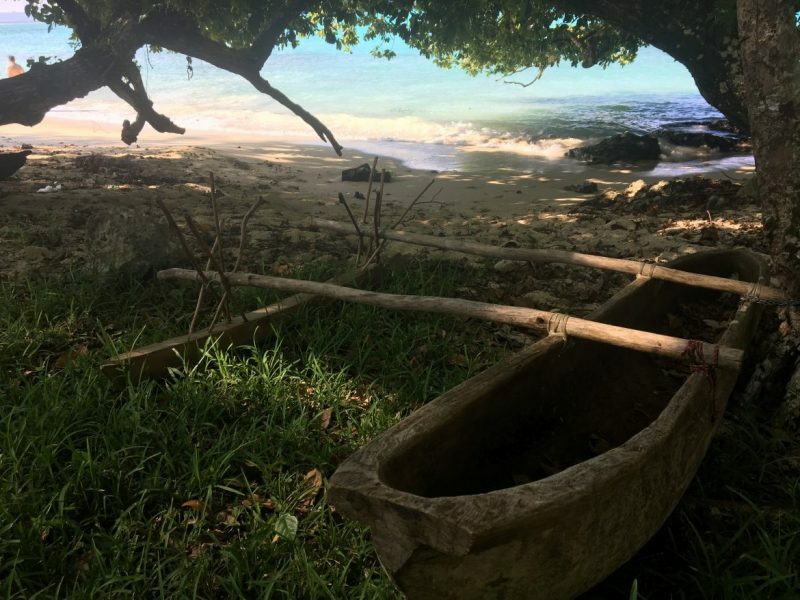 Vanuatu is a tiny group of islands off the coast of Australia classified as a Third World country. 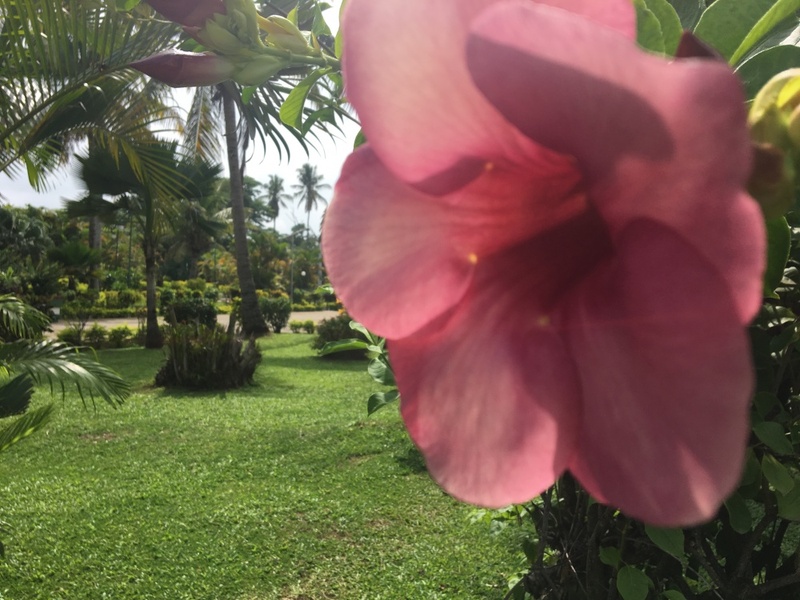 The cost of fuel, food, rent, internet, electricity, gas and a vehicle are all either the same as or higher here in Vanuatu than at home in Canada. I looked over at my daughter sprawled across the bed, her island braids falling at her side. I Lay in bed pondering her comments. What does make us in North America so unsatisfied with our lives? So full of independence, and fear, and anger and hatred? So quick to bully, to be a victim, to point fingers, so eager to complain, so insistent that ‘fairness and justice’ be served. There is nothing fair about this life here, but I have rarely seen even one person show signs of dissatisfaction due to the inequality of their situation. Every day children are separated from their mother and father and are given to relatives to satisfy a debt or a custom ceremony. Cyclones, tsunami’s, & earthquakes flatten their little tin shacks and destroy the precious food growing in their gardens. People die often because of infections, lack of medical care, and preventable diseases. But the people here are not sad, the opposite is true actually. 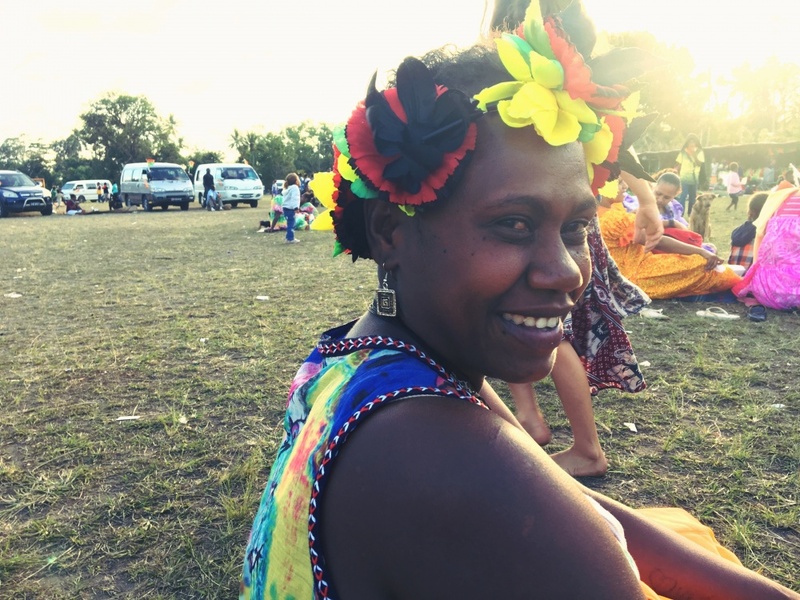 Friends and strangers alike kiss each other on the cheeks, touch each other as they pass by, and yell out greetings as they bump along the dirt roads in the trucks and buses. I have not met a single person that does not have a deep faith in God. Their faith is not something to be ashamed of. On Sunday, every store shuts down and every person returns to their family and their separate churches to worship. 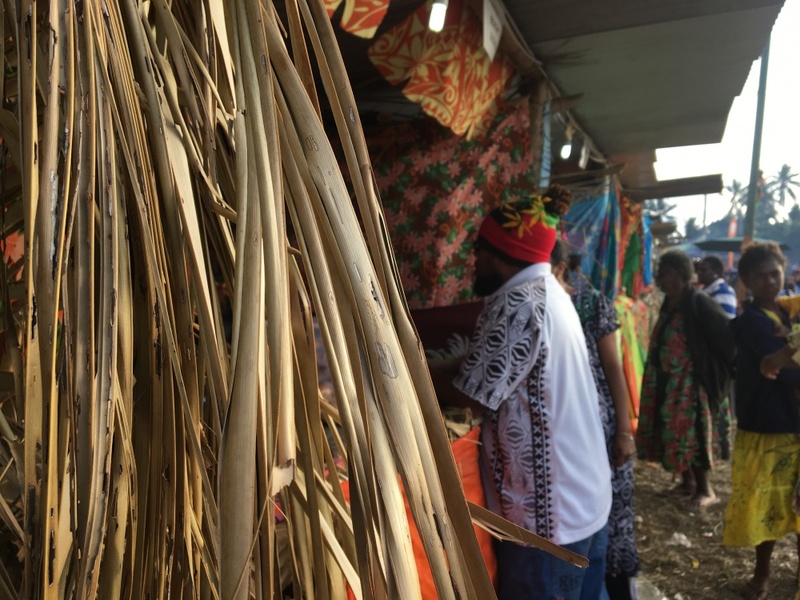 If a cyclone is approaching the community prays together and on the radio, and at the local market it is announced for people to repent, and remember God. 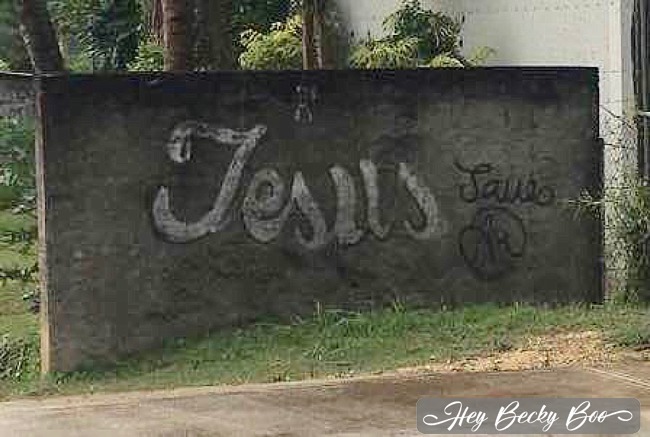 Here where the dogs and chickens wander into church and the graffiti on the wall says “Jesus Saves”, Gods masterpieces, and His miracles are all around us and nobody is ashamed to point them out or to praise them. In some ways our fancy, fast, first world country is ahead of these simple island people, but in many ways we are so far behind. As a homeschooling mother of 7 amazingly adorable kids (no I'm not biased) and the wife of the best man ever, I stay super busy. 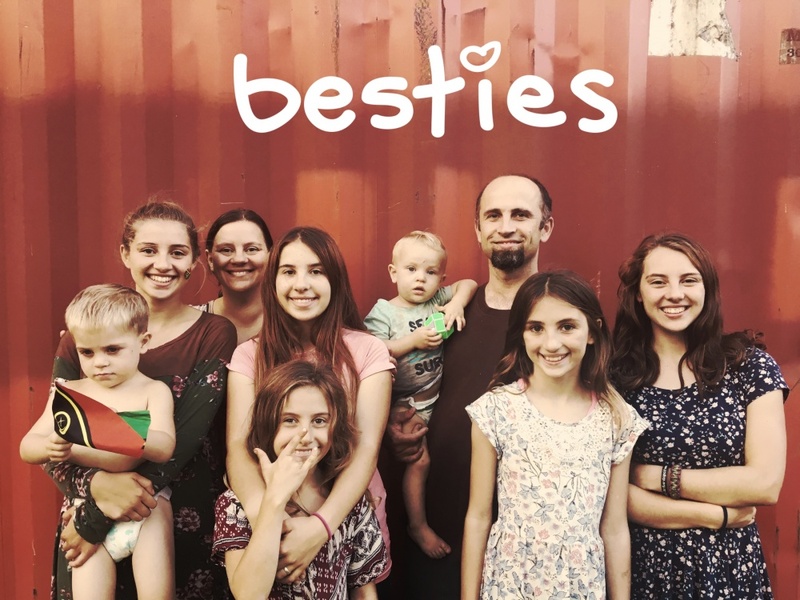 Originally from Canada, right now we are homeschooling on a little third-world island off the coast of Australia. I invite you to share in our adventures! 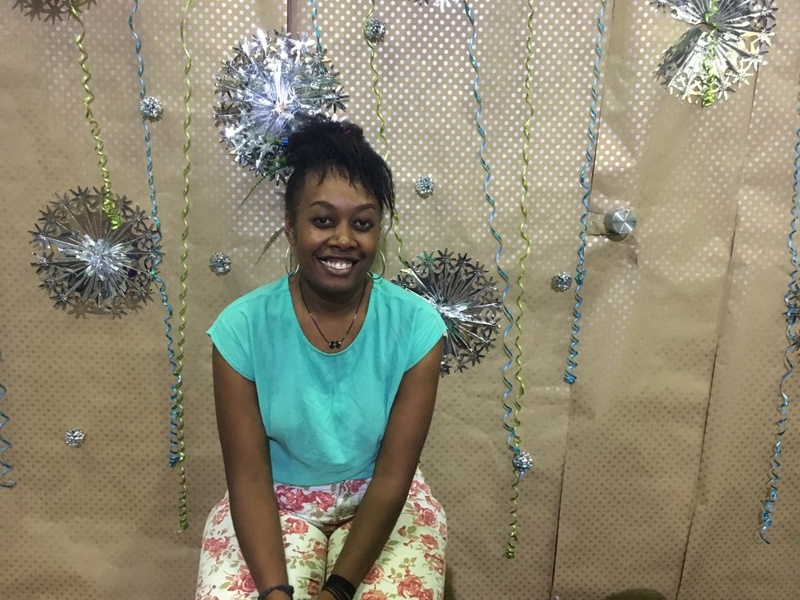 Lorraine McKay on Light the World with Fun, Magical Christ Centered Christmas Traditions! 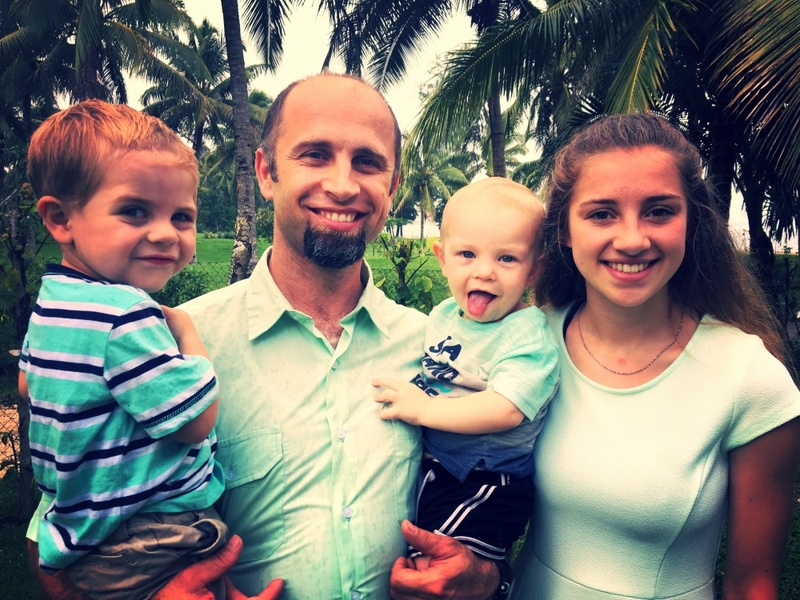 DENNIS MCKAY on 7 Tips to Being a Calm Mom and Rockstar Wife! 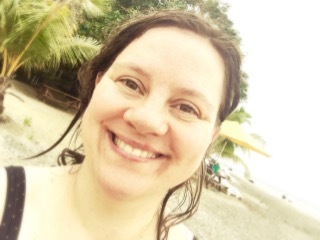 Lorraine McKay on 7 Tips to Being a Calm Mom and Rockstar Wife! 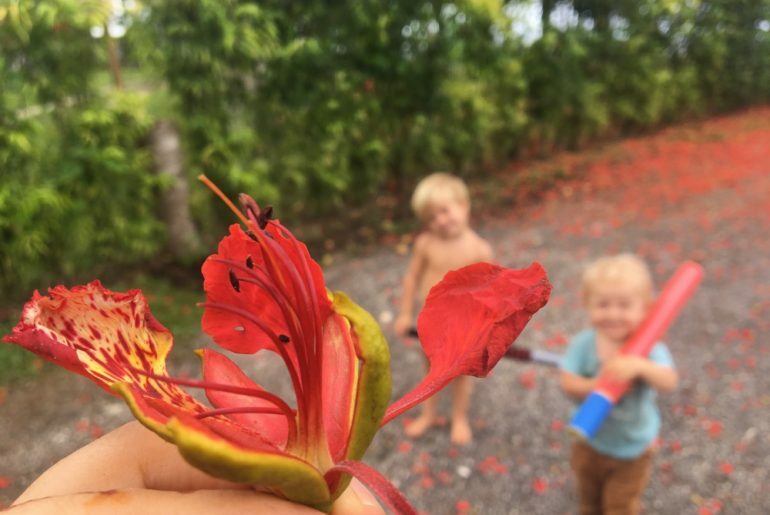 Naomi Pedersen on 7 Tips to Being a Calm Mom and Rockstar Wife!